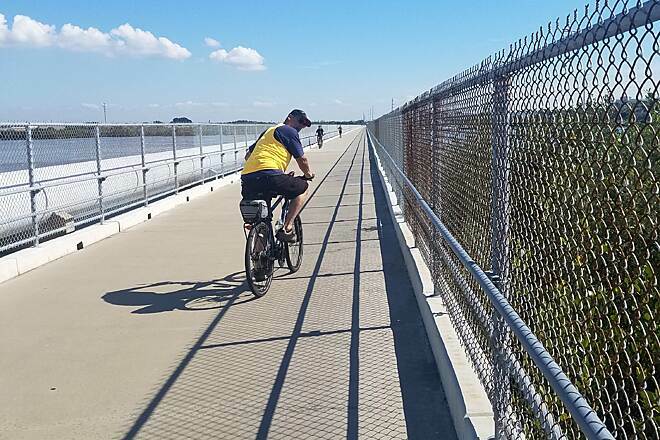 One of Florida's most popular and unique urban pathways, the Pinellas Trail stretches from St. Petersburg north to Tarpon Springs, and on into Pasco County with the opening of a 5-mile section in July 2017. 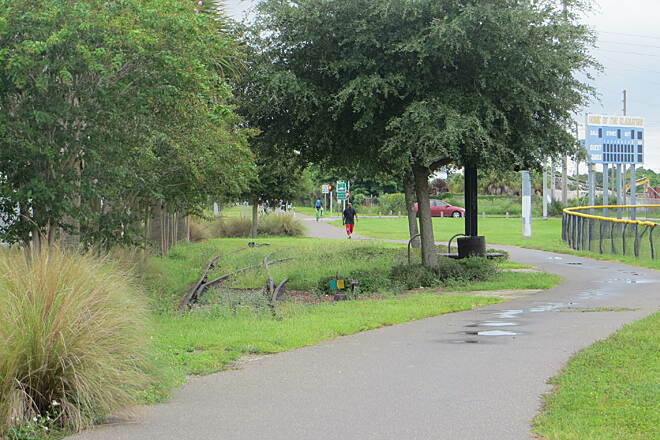 The pathway is part of the Coast to Coast Connector, a developing trail network that will span 250 miles across the state. Along the route, the rail-trail connects several county parks, coastal areas, and communities. 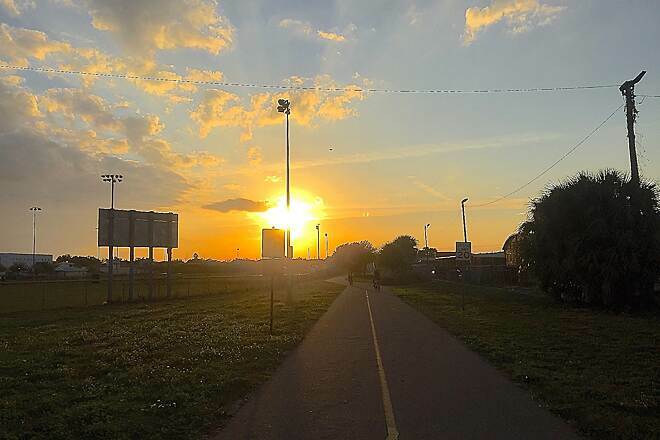 Its multiple access points, mile markers, and parking areas make the trail—and the communities it connects—very popular destinations among cyclists. 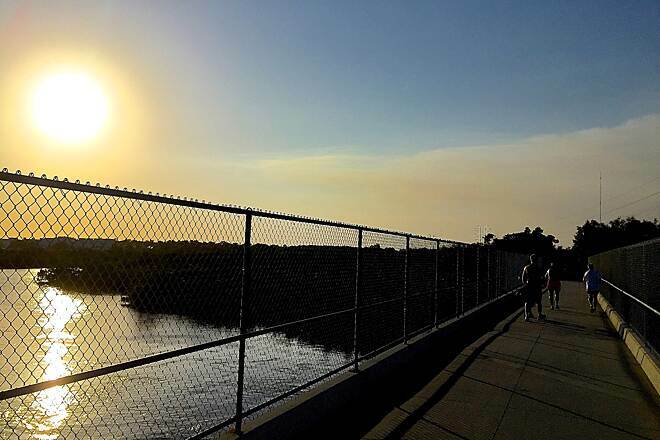 For the first 15 miles from St. Petersburg, the trail crosses dozens of pedestrian bridges with sweeping views of the urban landscape. 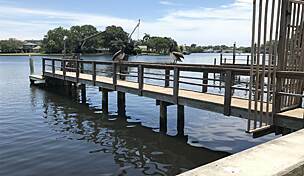 The most scenic of these is the 0.25-mile Cross Bayou Bridge, which spans Boca Ciega Bay. Farther north lie the towns of Largo, Clearwater and Dunedin. 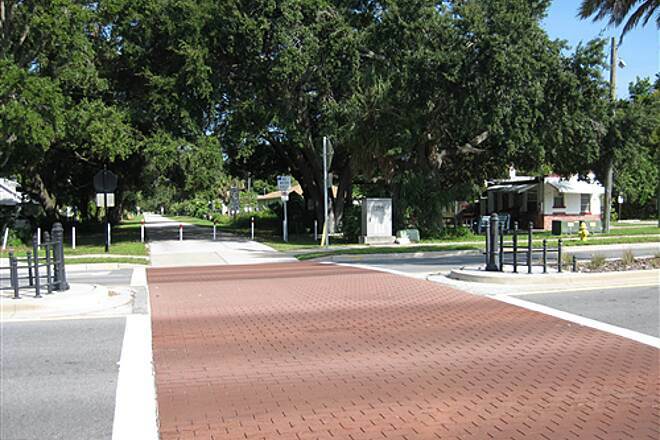 In downtown Clearwater, the trail merges with wide sidewalks and a newly resurfaced bicycle boulevard. Use caution through here because the trail crosses roads with heavy traffic. 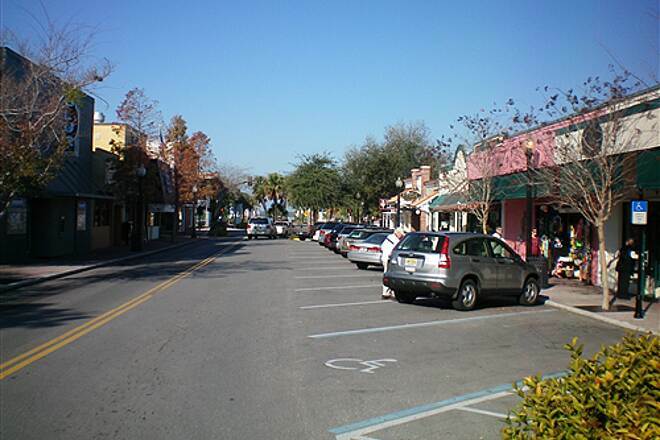 Dunedin offers a particularly pleasant scene, with shops, restaurants, public restrooms, and parking. The Gulf of Mexico is just two blocks away, worth the brief detour for lovely coastal scenery. In the quiet township of Palm Harbor pause on the Bayshore Boulevard pedestrian bridge at Mile Marker 29 for more Gulf scenery. 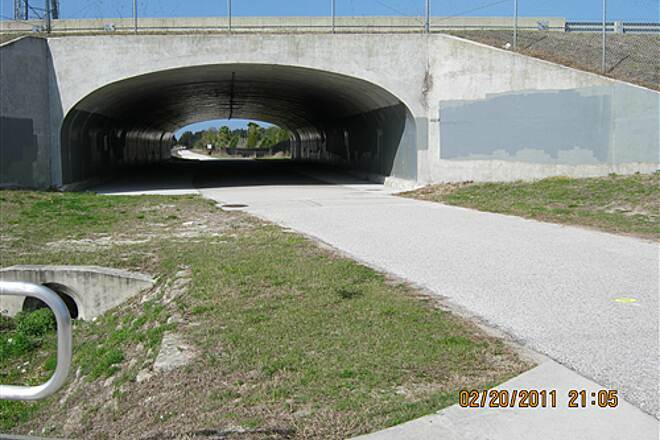 From Tarpon Springs' quaint business district, the trail continues under US 19 to Keystone Road (CR 582) at Melon Street. 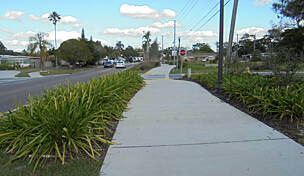 The Fred Marquis Pinellas Trail is accessible from numerous places along its route. For a trail guide and detailed map of access points and parking, visit Guide to the Pinellas Trail online. I've been writing this trail for the last 20+ years,it's awesome! scenery is fantastic,and the repair stations, with tools,and air and usually water,great planning. People are courteous always saying hello, how are you. I look forward to riding this trail,every march and October, when I'm vacationing at Indian rocks Beach. Congrats to the wonderful people who maintain and volunteer to keep this trail so wonderful. Thank to all... Dave,Lewiston N.Y. 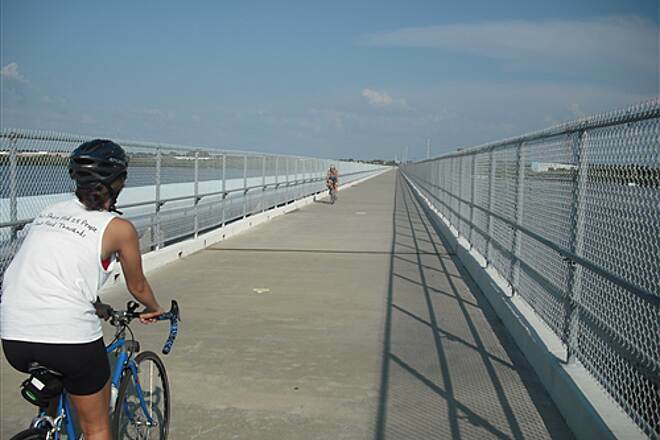 I often ride the Pinellas Trail from Gulfport up to Largo and catch Gulf Blvd on the way back. The trail is smooth and easy to follow! My favorite part of the trail is across the water north of Park Blvd/Target in St. Pete. This trail is OK. 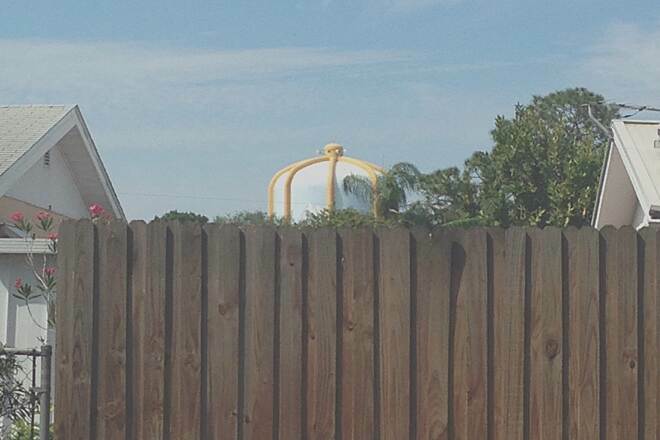 I ride it every summer from the Target Parking Lot North. Rode it once South and East into St Pete, but did not feel safe from Central Ave to Tropicana Field. Downtown was really fun. But I returned back on 1st Ave North. Was in Tampa for business. My wife and I rode the trail from Seminole to Honeymoon Island and back. We were very impressed with the trail. Thank you for this delightful opportunity to see this area. We will come back to ride the entire trail in the future. Rode from about 13 mi out into St Pete. Nice trail with varied scenery. Was aware of safety concerns from other reviews around Gulfport but didnt encounter any (mid--afternoon). Intersections not a big deal. 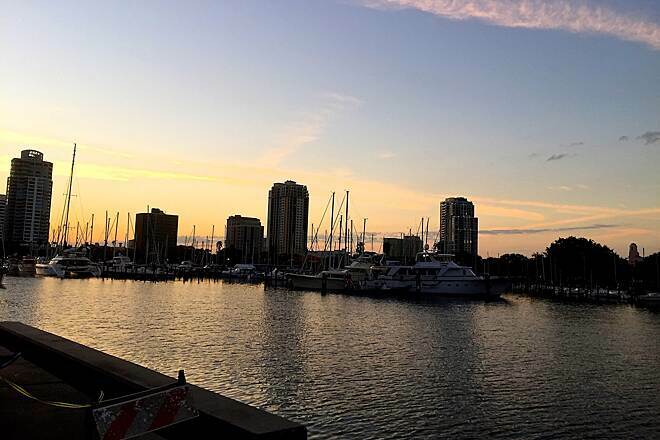 Love the downtown St Pete area & waterfront trails around the marina. 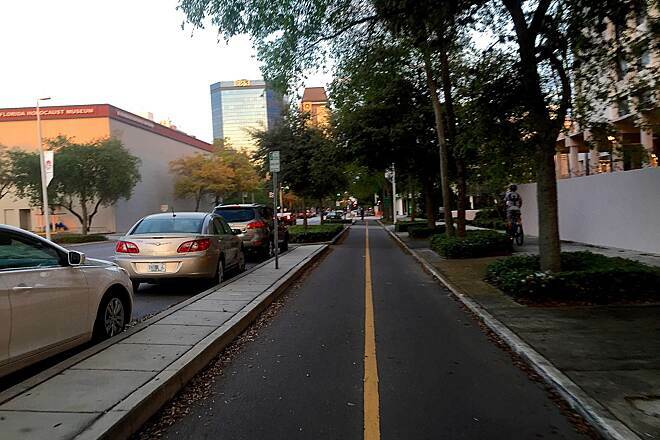 Very bike friendly whether on the trails or streets. Recently rode approx 15 mi south from Tarpon Springs. Enjoyable, leisuely ride, intersections not an issue as the trail is not a racetrack. Do wish there were rest facilities along the way so you didn't have to leave the trail and find a nearby business establishment. This trail is right next to my house and I've ridden on it for years. 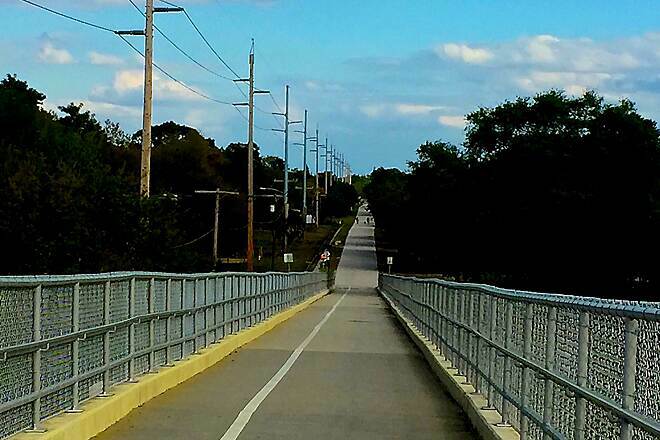 The Pinellas trail is the best way to get around on your bike without being hit by a car. Florida has some pretty crazy drivers and a lot of bumpy sidewalks. This trail has increased my quality of life greatly. 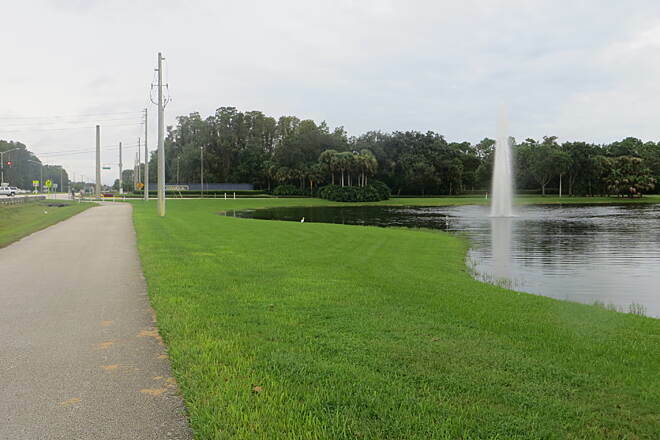 We parked at Seminole City Park near Park Blvd, and rode south 6mi to StPete College Gibbs Campus, then back north to Walsigham Rd. - about 19mi roundtrip. The good news is that there are bridges over many of the busiest roads, so you don't have to hassle with traffic to cross. The bad news is they require going up and over the bridge. There were 5 overpasses in this 10 mile stretch.Good for leg burns and cardio, but not good if you are looking for a leisure trip on a flat trail. Otherwise, trail is good, going through neighborhoods and some parks. Looking forward to doing other northern sections. Snuck away from the family for a day to ride the trail from St. Petersburg up to Chesnut Park. The trail, like most, is pretty uneventful for many miles, but there are plenty of places along the way to stop, cool off, or get supplies if you need them. 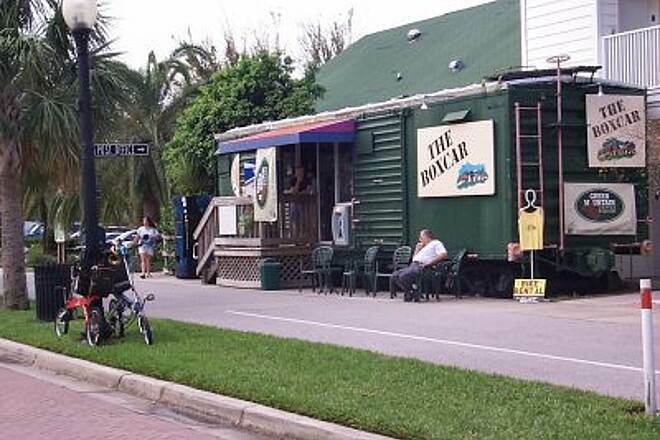 The section through Dunedin was pretty unique - recommend stopping at the Boxcar Café for a bite to eat, a Gatorade refuel and/or a personal pit stop. 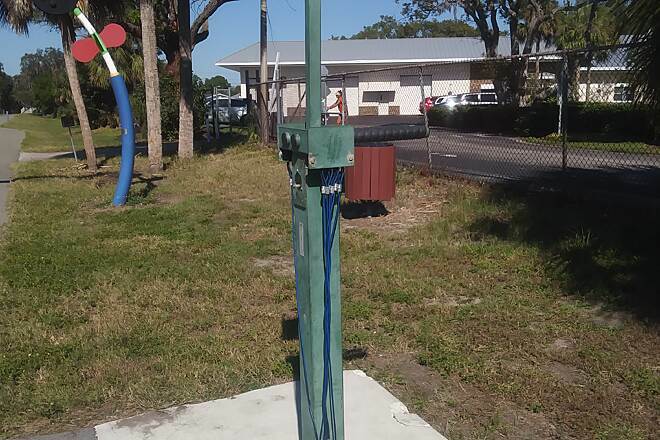 Saw a few places along the trail where you can refill your water bottles (but keep in mind they are outdoor fountains so its warm) and even get air for your tires. 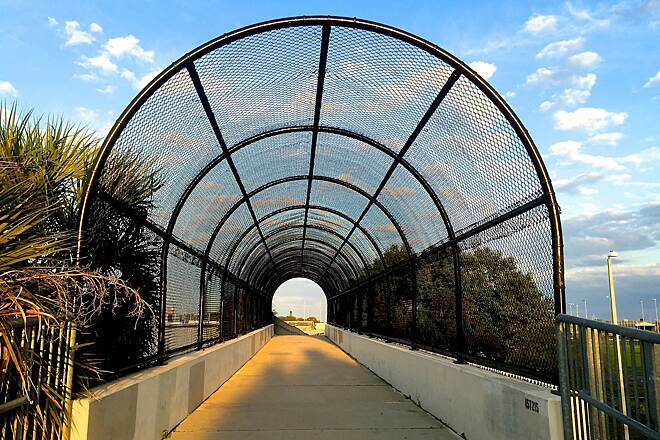 The pedestrian bridges on the south end can be a bit grueling, especially at the end of an 80+ miles ride. Would definitely like to do it again, just not the 3rd week in July. I read all the reviews, but did not really study the map. My bad. I was looking for a trial for some interesting scenery and a chance to do some fitness riding. Well, this trail provides a great deal of opportunity for practicing your clipping in and out. The trail is constantly interrupted by cross streets where you have to stop for traffic. The drivers are very courteous, but you still have to stop for safety. So, no clip in and ride. If you are looking for fitness and uninterrupted riding, give this trail a pass. Hands down, best trail I've discovered to date! Pinellas County Trail My wife and I have spent the past two weeks in Largo, Florida and I have had the opportunity to ride 400 miles on the The Fred Marquis Pinellas Trail. I am so impressed with this beautiful trail! 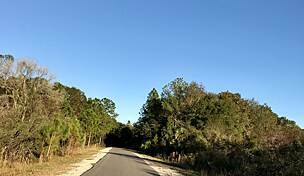 I just wanted to compliment all who work to maintain this outstanding recreational corridor between St. Petersburg and Tarpon Springs. The trail is well designed and maintained. 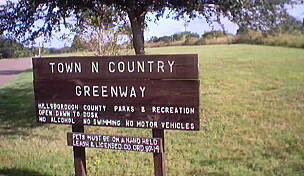 The signage makes it easy for vacationeers like myself to access the trail and exit to visit surrounding neighborhoods. 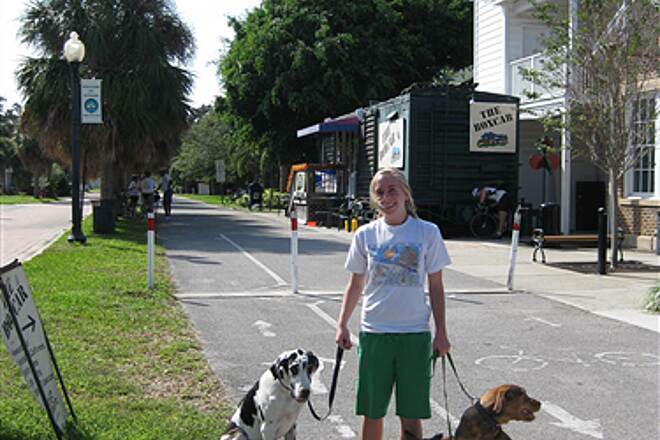 The many bike friendly communities adjacent to the trail offer a wide variety of food, drink and fun activities. I appreciate the trail workers (some of them volunteers) who maintain the trail and offer directions and help when needed. The thing that impressed me the most, is the courteous Florida drivers. Even at intersections where “cross traffic does not stop,” I was often waved on by vehicles crossing the trail. What a pleasant experience. 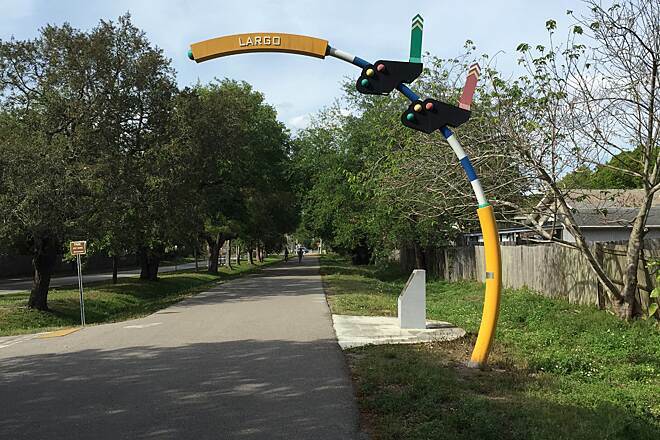 I look forward to my next trip to Largo, so I can spend more time on this wonderful trail! Stopped in local bike shop in Gulfport for repair. We started our ride in Tarpon Springs on a Saturday in January. The trail itself is a nice trail, but it goes through some densely populated areas and there were many riders, walkers, runners, etc. There are areas on the trail where the trail divides and walkers can use the smaller trail to the side of the bike trail. The problem we encountered was the huge numbers of people. This kind of trail brings lots of tourists to the trail that are unfamiliar with biking "rules of the trail." Many walking groups with kids that didn't seem to even realize fast moving bikes could be on the trail as well. In the towns it is especially bad, in between towns the riding gets better as the crowds diminish. Many, many cross streets in the towns to deal with. We rode two sections on the northern part of the trail. If it was crowded near Tarpon Springs and Dunedin, what would it be like closer to the large southern cities? I think its a great trail, well used, and in good condition. Its just not for everyone. Also when a trail is crowded, is it too much to say "on your left"? In all our Florida trail experiences, so many riders passed us zooming by with no thought to warning those they were passing. Florida trail riders, please use trail etiquette. 12/26/15. Every December I come to Tampa Florida and ride this trail. I have been doing this for the last few years. This is simple a great trial and should be enjoyed much as possible. I have wanted to try this trail for a number of years with my in-line skates - it was worth it! Started at an access point near Park and Pasadena and made it as far as Dunedin and back. 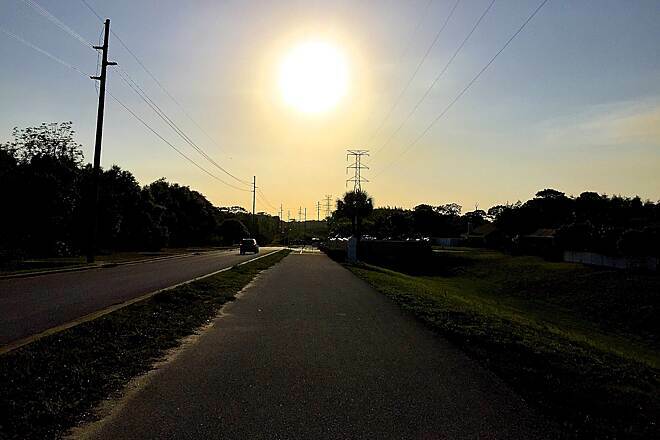 Most of the trail was in great condition (fairly smooth pavement), taking you through several communities like Seminole, Largo, Belleair and Clearwater. Passed numerous cyclists, runners and walkers with strollers. Some water fountains, restroom opportunities along the way as well as food options (convenience stores or quaint coffee shops). Several bridges and uphill challenges along the way. Great trail option especially for an in-line skating adventure! 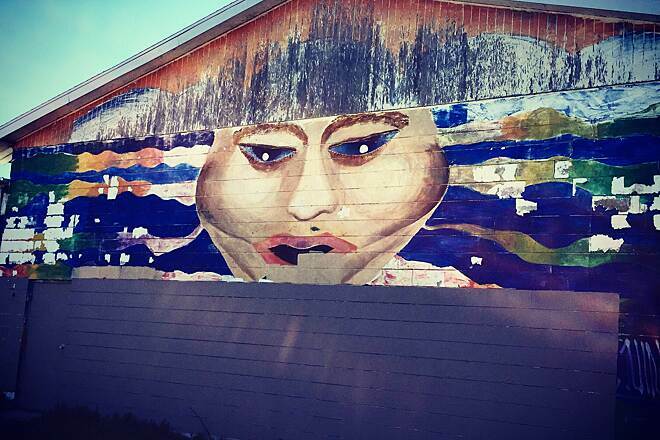 Started at about East Tarpon Ave. Rode south about 5 miles did a turn around and went back and had brunch at Toula's Trailside Cafe. Will definetly eat there again. The trail was not overly crowded on the day we went. Sunday, 4/26/2015. The weather was over cast, so it wasn't too hot. I look forward to doing more way points. We live in St. Petersburg. We road the trail today and our son rollerbladed with the stroller. No problems. There were at least 10 people we passed coming from the other direction and several high school kids walking near the high school. Everyone was friendly. We've ridden the trail in the past and stopped at the fish store on the path on the way back. We've taken the trail to have lunch in Gulfport. What a great way to spend the day. Stories about people being robbed and beat up and having their bikes stolen scared me for a while but not to use this trail would be sad. It's a good ride, for good exercise. People need to use the trail--go in groups but go. A more populated trail would lead to a safer trail. I rode the section from Dunedin to Tarpon Springs a few times on a recent trip to Florida. While it was really nice to ride in warm weather the trail is not one I would plan a trip around. This trail is crowded and there are lots of road crossings making it impossible to get into a good riding grove. 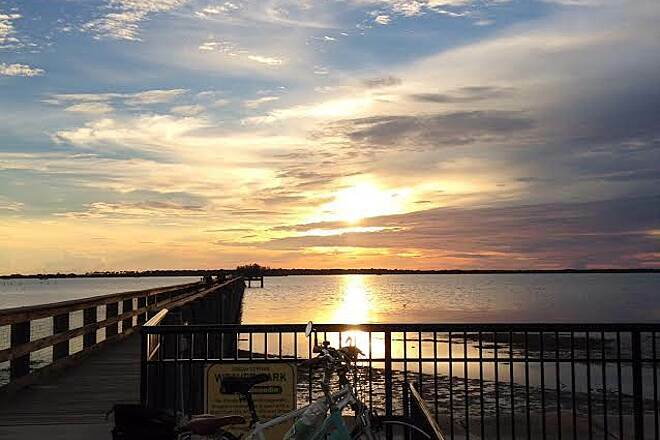 The towns of Dunedin and Tarpon Springs are pretty cool though with lots to see and plenty of places to get a bite. 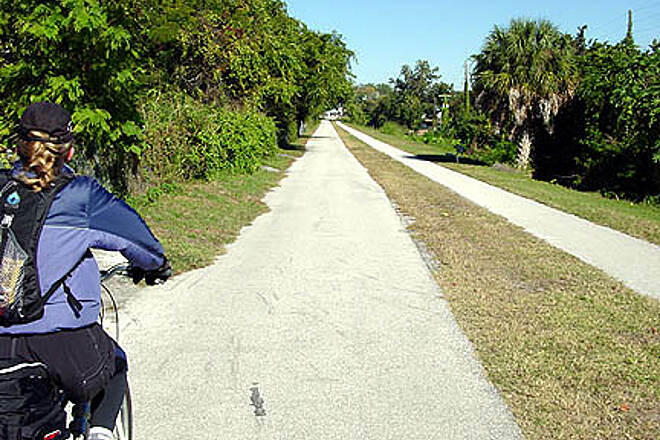 On my last visit to relatives near Dunedin, I biked the Pinellas Trail several mornings. There was an immature, pileated woodpecker on a wire just above the trail. Atop poles next to the driving range alongside alternate Hgwy 19, there were ospreys in their nest and a flock of wild parrots. A wood stork flew overhead further along the trail. On my return from Tarpon Springs with Greek pastries in my bike bag, a large raptor circled right above my head and lighted in a nearby pine tree. This turned out to be a mature bald eagle staring at me from about 15 feet away. 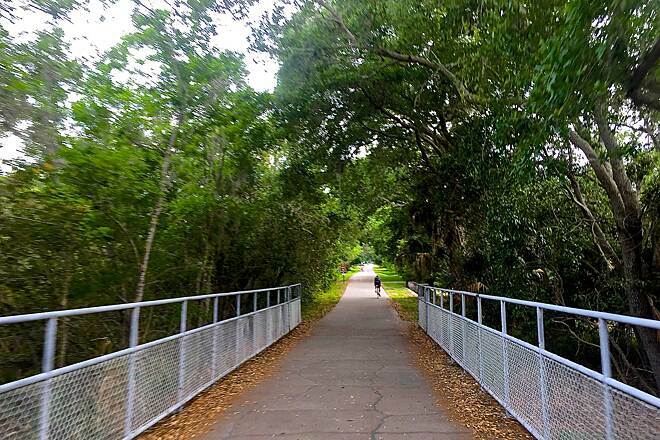 Pinellas Trail often has more delightful surprises than rural trails. I ride the northern third of this trail several times a week, and love it. The middle and southern sections are more urban, but are well maintained and pretty well marked. Came back to Dunedin for the second long weekend. 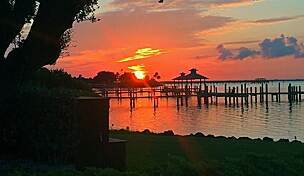 Have also spent weekends at Tarpon Springs and Gulfport. Always look forward to The ride and the towns. This is a great trail for folks who live in the area and would rather travel by bike than by car. But, if you are looking for a riding trail or something with a view, there are better trails in Florida. This trail has many stops and intersections. And there are less than a couple of miles with any sort of view. Most of the trail is through the back of subdivisions; some of them somewhat sketchy. 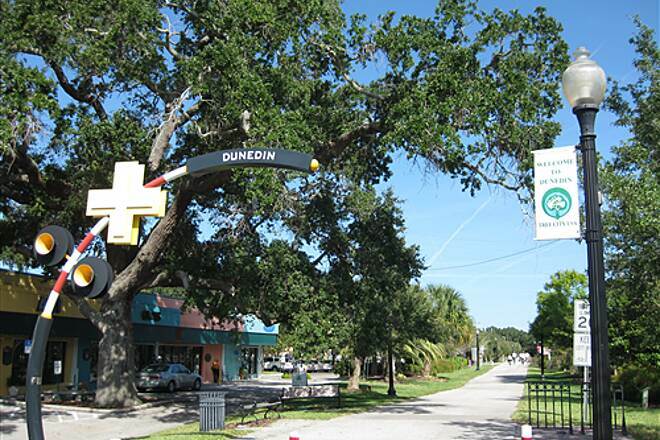 Dunedin was a great part of the trail with nice cafes on the trail. Wouldn't return here for a 'ride'. Since we drove from PA to Tampa for a family visit, I was able to bring my bike. I wanted to do a decent length ride, and had come to Trail Links to find a suitable destination. The Pinellas trail did not disappoint. I arrived at Clearwater and rode towards St. Pete's city limits and then returned going past Clearwater getting in 40 easy miles. Having read other reviews and the issues mentioned with the number of crossroads, I went with the expectation that this would be a recreational ride. I was not disappointed. Yes, cross roads were a pain at time (especially going through Clearwater with a stop sign at each block) but autos were always courteous (a far cry from PA roads). As I went extremely early because of the heat and it was a weekday, the trail was extremely easy to navigate. Plenty of places to fill water bottles, grab something to eat, rest rooms, and of course a few places to get off the trail and enjoy the water view. Although not related to the trail itself, I was disappointed at how many times I said, "Good morning", and not even a nod of the head in response. Next time we come for a visit (hopefully when the weather is cooler), I will definitely return for a ride. For Day 1, we drove to Honeymoon Island State Park, left the car, hit the spur over to Dunedin, took a left and headed north to Tarpon Springs. The trail is reasonably wide and often has a separate pedestrian path paralleling the bike lanes, which is very nice. We had to cross two major intersections, but otherwise, most of the crossings were so lightly traveled by vehicles that we didn't need to stop. In fact, I must say that from Dunedin north, drivers are almost invariably courteous and considerate of cyclists (something I wish we could import to our hometown). This part of the ride took about an hour (we were not out to break any land speed records), and we arrived in Tarpon Springs about 10 am. We spent a little time at the sponge docks and were a little surprised by how quiet and empty it was - not a whole lot going on. We left the Springs at about 11 and headed back south to Dunedin, destination Dunedin Brewery. If you haven't been, and you like good craft beer, this is a must. They have outstanding wheat, red and brown ales year-round, and the staff is friendly and outgoing (and very much into cycling). We then headed to Casa Tina for an outstanding lunch of chorizo and steak tacos and chile rellenos. From there, it was back to Honeymoon Island where we racked and locked the bikes, grabbed our beach stuff out of the car, and hopped the ferry over to Caladesi for a few hours of sun and surf. Overall ride was about 30 miles for the day. Day 2: Meant to get up earlier, but we finally got on our bikes at about 9 am. Headed off Clearwater Beach, over the Causeway to the Trail. 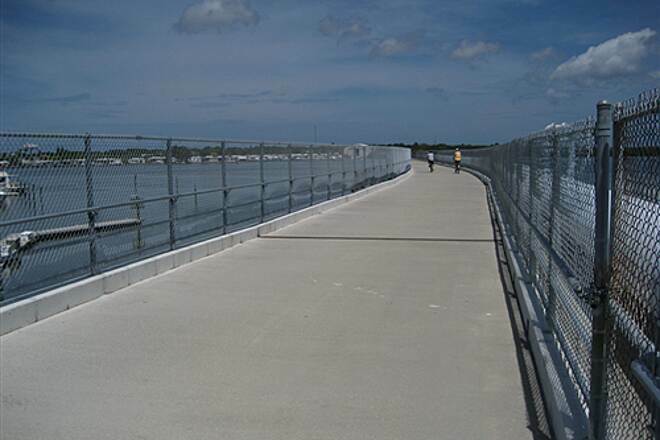 There is a nice, wide bike/pedestrian path on the Causeway, and the climb over the channel is not as bad as it might look. When we got to the other side, we took a right on Palm Avenue, and then a left on Turner to get away from the traffic flying down Chestnut. Turner links up with the trail about a block down. Our original plan was to ride south at least down to Long Bayou, as we had read that anything south and east of that (into St. Pete) might be a tad dangerous. 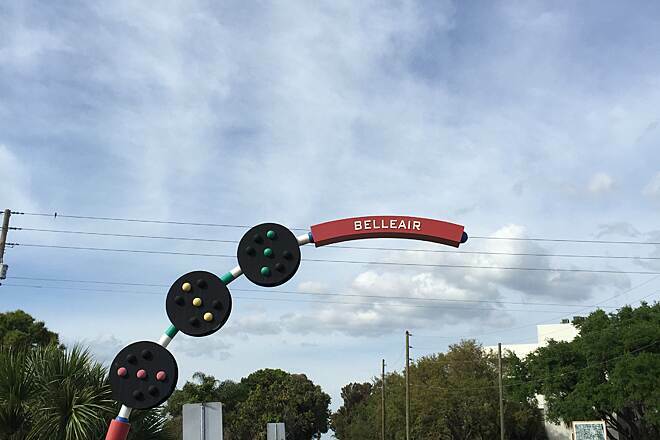 We got as far as Belleair (which really is not very far) and turned around. The trail was simply not as nice down that way and we encountered a couple of places where the sides of the trail had caved in. Moreover, we really wanted to go back up north to Dunedin and visit the Brewery again. So . . . we turned around and headed north. The trail through Clearwater is for the most part a bike lane on East Avenue (it’s designed for two-way bike traffic, but is along the west side of the Avenue, so if you’re heading north, you are biking against traffic). Not wonderful, and the drivers here, unlike a little north, are not as considerate. We decided to make for St. Andrews Links, a golf course and driving range in Dunedin, to take advantage of the $10 deal for a large bucket of balls and two beers. The staff in the golf shop there was friendly and helpful, and they even have spare golf clubs available for use if you happen to bike in without your gear. The beer there, sadly, is not craft, but I had forgotten that Yuengling is actually pretty good for a mass-produced brew. Having finished our golfing (Pam, who had never hit a golf ball in her life, was convinced that she would be awesome at the driving range – NOT!! ), we decided that lunch was in order. Why not eat at the Dunedin Brewery, considering how good their beer is? And, so, we did. The Brewery serves up a tasty burger, accompanied by chips and salsa. Having finished lunch, we decided to pack it back to our lodging so that we could spend the last of our time in Florida on the beach. All told, we rode 22 miles on Day 2. We really enjoyed riding this trail and would recommend it to others. There are bathroom facilities available along the way and plenty to see and do. For the most part, the trail is shaded. BTW, my wife and I are in our late 50's, ride consistently about 50 to 70 miles a week, but are not speedy pro road bike kind of folk (we ride hybrids with road bike tires, wear bike shorts but not bike jerseys, and don't clip in). First morning rode from Palm Harbor north through Tarpon Springs and on to Keystone Rd. Great scenery with only one busy crossing on Tarpon Ave. People on the trail were very friendly and trail had only one section that was quite "bumpy" due to buckles in the asphalt. Second morning rode from Tarpon Springs through Dunedin. Again, it was a great ride with refreshing scenery and wide trail. I look forward to returning and working the sections from Dunedin to St. Pete in the future. Worth a ride for sure. Just knocked Pinellas Trail off my biking bucket list. At over 40 miles of the widest trail I have ever ridden it was a joy to ride. It goes through some rough areas but I never felt unsafe. It is more like an alley that runs through many towns in central Florida. Most of the trail has houses or businesses on both sides, so not exactly a nature trail. Many cool over passes that go over water and roads. If you go the whole length of the trail you will go through many different municipalities and it would be nice if they were a little better marked as to where you were as well some miles markers would be helpful. There are bike shops all up and down the trail for bike rental, sales and repairs. Bicycle Outfitters had a great selection of trike recumbent bikes to rent that I will be sure to try when I come back. Also a KOA campsite right off the trail that looked very nice, with reasonably priced cabins not far from the beach. I rode pieces of this trail last week. The trail planners/engineers have incorporated some good traffic safety features into it - bridges over or under major thoroughfares; 4-way stop signs at some lesser-used street crossings, etc. I nice feature of this trail is the ability to ride offshoot trails along the bay causeways. For this Midwesterner, that was a real treat and something very different from the normal I ride. 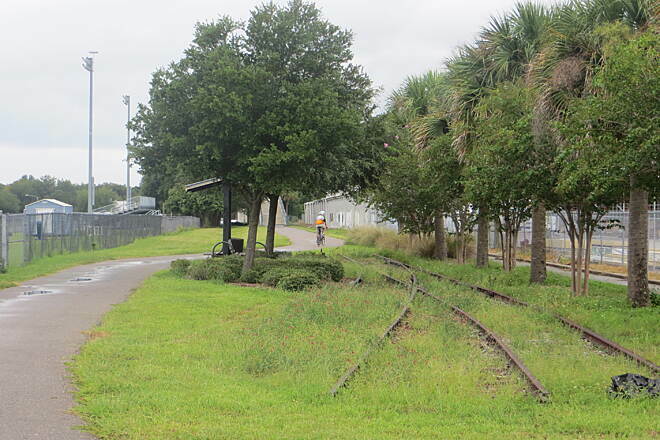 The railroad/street/trail in downtown Clearwater was interesting. 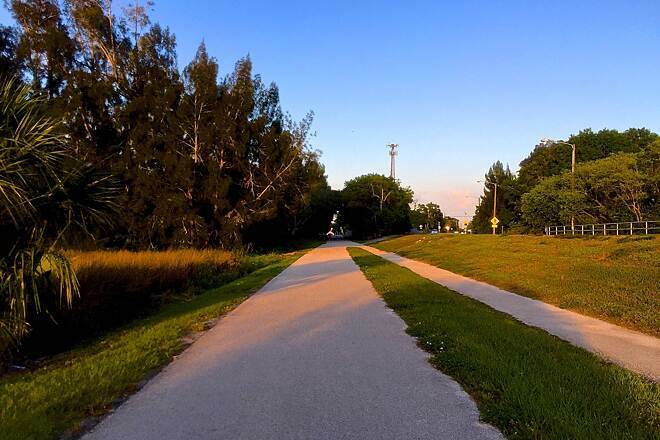 The Pinellas Trail is a wonderful place to Cycle, Run, Walk or Rollerblade. But please be aware that there has been another mid-day robbery of a couple near 49th Street South. Both bicycles were stolen and the wife was pistol whipped in the face. Local bicycle clubs are attempting to raise awareness and encourage the City of Saint Petersburg to increase police presence in the area. Starting from near the middle, I rode an out and back of the north half the first day and the south half the next day. Both rides were a lot of fun. The downside with the north half is the large number of street crossings. The cars were very courteous, but there is a lot of slowing down and speeding up. 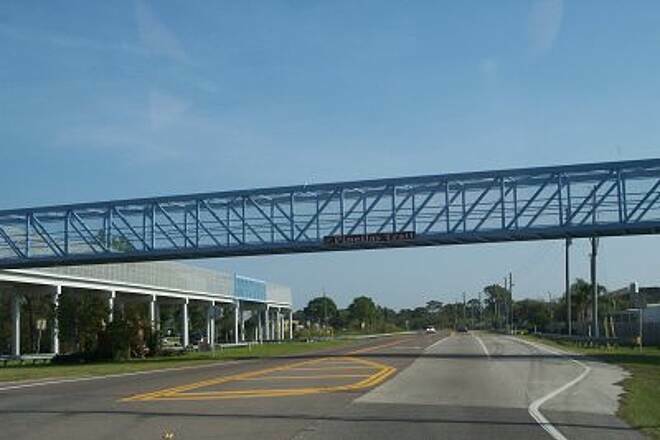 The south half seemed to have a lot less road crossings until you get to downtown St Pete plus it had overpasses for many of the intersections. However, when I stopped in the bike shop after my ride, they warned me off of that section and told me about another customer that was jumped and ended up in the hospital. The day I rode that section was pouring rain so I didn't see hardly anyone, but some of the neighborhoods do look a little sketchy. Its been several years since we've taken the trail from Dunedin to Tarpon Springs looking for the trail end as we heard it would loop around eventually. In the past it ended at US 19. We were delighted to find this weekend that it has been extended. It follows under US19 and then along Keystone Road to Mcmullen Booth Road (apparently aka Eastlake Road). 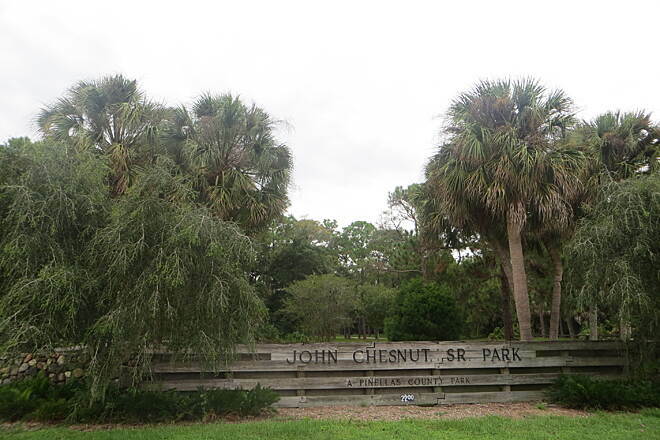 The trailend or start is now at John Chestnut Sr. Park. The trail is well-shaded in the afternoon and passes a few convenience stores but is otherwise uneventful. 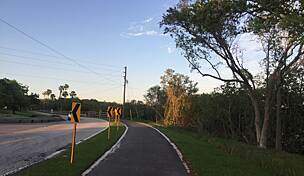 It would be nice to see this trail travel to/thru Safety Harbor. Just road the entire trail. From Clearwater north is the nicer half of the trail. We will ride it again but will not bother to go south of Clearwater. I would recommend staying close to the trail as parking and access are a bit confusing. Don't expect a lot of water views but it is a nice wide and maintained trail. 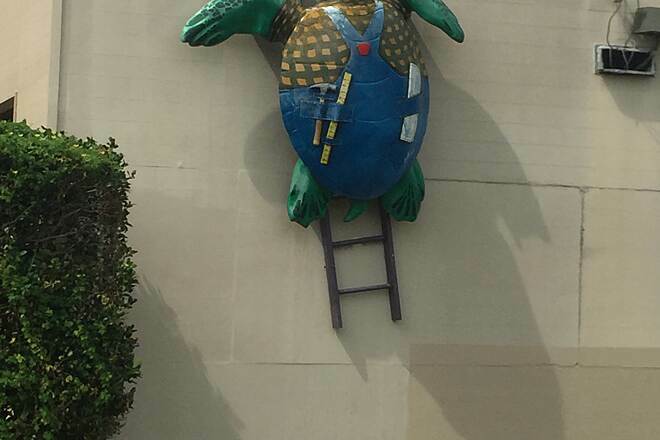 My favorite part was Tarpon springs. We did not have time to check out Honeymoon island....next trip! I ride it daily, and there's areas where you just do not want to ride. Since it's finish appx 20 years ago, it's been very ignored by the county. There are stretches that are washboarded, and most of it is never cleaned, except in more affluent areas. One major stretch from Seminole to St Petersburg has more broken glass then I've ever seen on any "bike" trail, so be sure to bring a patch kit, but good luck finding an air pump. DO NOT RIDE IT AT NIGHT! If the muggers don't get you, the storm trooping Police will, tickets are how they make the money here! Great idea, fiscal mess. 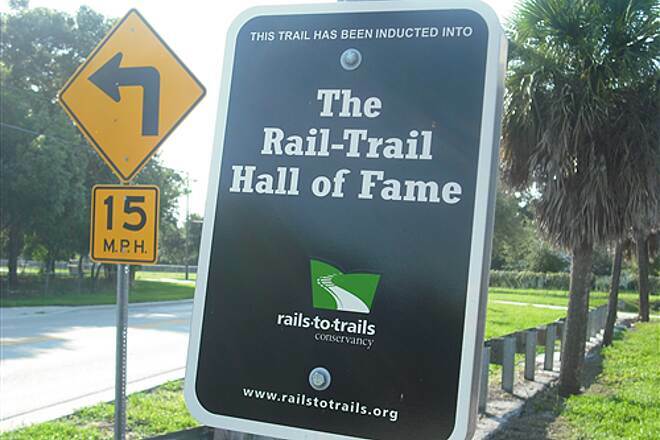 No one mentions that the Pinellas Trail is actually a county park, and therefore it is closed to the public at night! The county deputies stopped me and another rider who were heading north out of Dunnedin after dark in Nov. 2012, and told us the trail was closed and advised us to use the highway--which does not have a shoulder or bike lane!! Since I told them I was from out of town and new to the area, they left me proceed, and the other biker was only going to the next intersection. What they are trying to stop is the use of the trail for night time camping and to make it more difficult for homeless folks (there are about 16,000 + homeless in the Tampa-St. Pete area per this website: http://www.cbsnews.com/8301-18563_162-57500598/tampa-area-has-nations-highest-homelessness-rate/ ) to camp alongside the trail or in county parks along the wayside. For instance, the beach alongside the road to Honeymoon Island State Park is closed to all use after 11 pm every night--very unusual, as beaches by the oceans are public property and people are allowed to fish, swim, make out, etc. all hours on most public beachs--but some towns use local control to keep the homeless from sleeping on the beach, others look the other way. I slept outside for five months last winter in Florida as I bicycled and camped along the east coast, and this year I am doing the west side of Florida, also sleeping outside every night so far. It is the real life!! I live in Kentucky where the landscape is generally hilly. 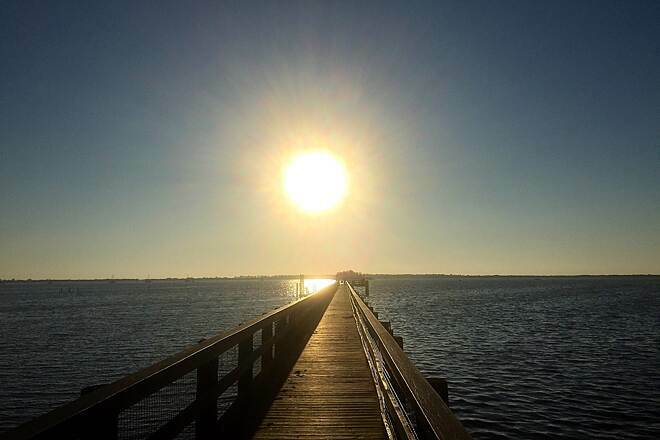 We recently purchased a second home in Dunedin, Florida and was so pleased to find that the Pinellas Trail runs within 2 blocks of our home. Love the relatively flat landscap of this trail. Still living in Kentucky, but hit the Pinellas Trail every time we go down to Florida. Love this trail. Have ridden several rides of anywhere from 5 to 15 miles and can't wait to get back down to explore more along this trail. Beautiful area! Dunedin is delightful! Highly recommend this trail. We did a 40 mile ride on the Pinelas Trail May 2, 2012. 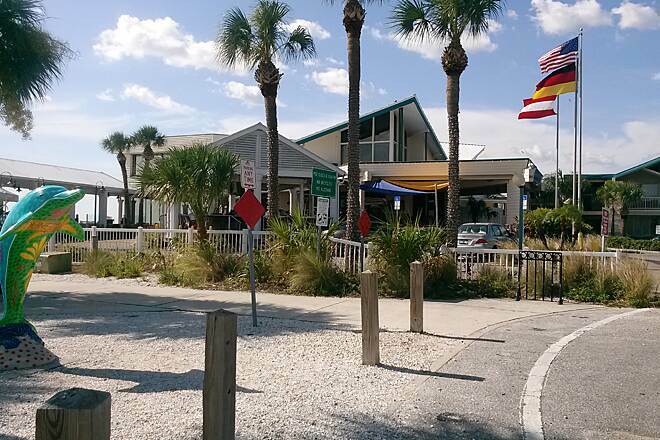 Starting at Dunedin RV, there is a nice little open air store across from the RV park (serves boiled peanuts----kind of like a bad tasting cooked pinto bean) and you can access the trail from there which is convenient if you are at the Dunedin or Honeymoon RV. We rode south to Dunedin, past the Par 3 golf course, and into town where we had breakfast at this cafe and deli on Broadway Street across from the Chamber of Commerce, just south of Main Street and one block west of the trail. Highly recommend the Broadway cafe/deli serving Kahwa coffee. It was hard to tell from the outside (we sat on the patio with our bikes close by) that this place had great breakfasts and friendly service. We did a side trip to Honeymoon Island; recommended but there is a fee. In the after noon we rode north to Tarpon Springs. Dunedin was a kitchy little tourist town. Tarpoon Springs was more of a working town and the trail was a little rough in places. Not sure where the trail ended exactly but we peeled off and went to Demetri's on the Water for dinner. It was a great Greek dinner place (park your bike with you on the outdoor deck) by the sponge docks. Check out the sponge docks before heading back to your camp. Make sure you put sun screen cream even if it looks cloudy day. 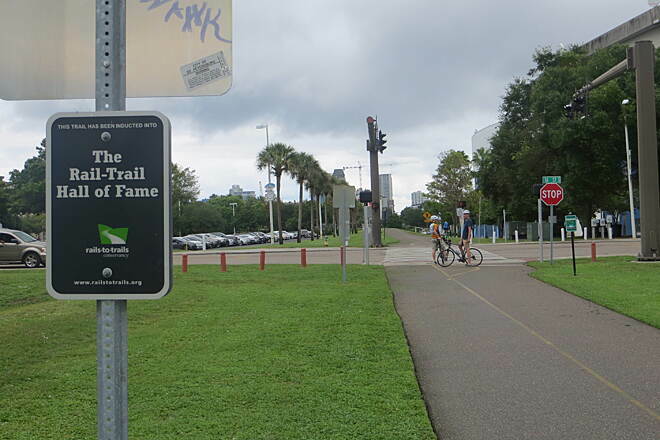 I just came back from a week trip to Pinellas county, Fl, where the famous Pinellas trail is located. I live in hilly side of Vancouver, BC, Canada and I am a casual biker and I ride on a hybrid and mountain bike. my arms were red. So, I bought ALOE "after sun" cream to soothe my arms. On the third day, I put sun screen SPF30 and thought I would be safe. By the late after noon, I had realized bubbles on my arms. By 7th day, the skins are peeling off. I picked up a motel, close to the Penellas Trail and a half way either from Tarpon Springs or Fort Desoto. I rented a hybrid bike for $76 including tax for a week and biked to Fort Desoto and back and to Tarpon Springs and back. The trail is basically flat, except when you go over an overpass over major street. back when you are coming back. I misjudged the time and it became dark when I was coming back from Fort Desoto. Luckily, I had a single LED light on my helmet which gave the light to warn drivers or bikers, but it was not enough to light the trail. You may want to take with you a LED light on your trip. To go to Fort Desoto, you have to leave the trail and rid on streets. But, I noticed that the streets are mostly bike friendly and pavements are wide and barrier free. So, I rode on pavement when I felt less confident in riding in the streets sharing with drivers. I really enjoyed riding amd seeing the surroundings what the trail offerl. We stayed on the northern half of the trail and didn't go south of clear water (because of the comment below). There were a lot of bikers, runners and walkers on the trail with was awesome to see. The trail was constantly stop and go, there for we could not keep speed up. This trail would be great if you are not looking to maintain a fast speed. On the way back we took the road along the water. It was safe and we had no problems with traffic. 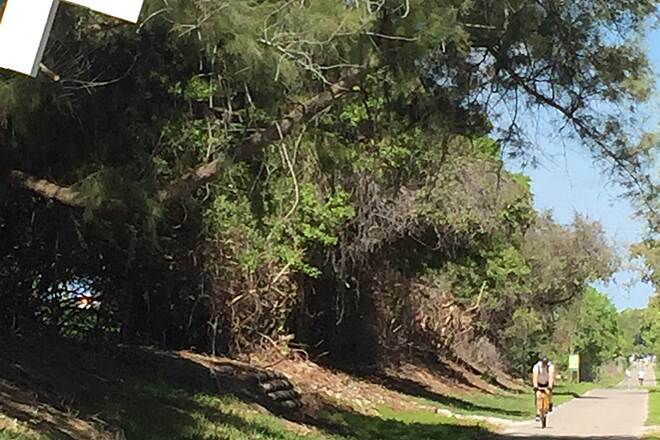 Stay off the trail from downtown St. Pete to Pasadena ave as there have been numerous muggings and stolen bikes. THE WEATHER WAS STILL REASONABLE AND ALLOWED A RIDE FROM CLEARWATER BEACH TO TARPON SPRINGS AND BACK. MADE SEVERAL SIDE TRIPS ALONG THE WAY. RECOMMEND CHECKING AREAS WEST OF THE TRAIL FOR GREAT GULF SIGHTS. THE TRAILS HAS SEVERAL CROSSINGS BUT THEY ARE WELL MARKED AND THE MOTORISTS WERE ALL ACCOMMODATING. TRY OZONA PIG FOR GOOD BBQ JUST OFF ORANGE RD. THE TRAILS IS ALWAYS CLOSE TO NEARBY RESTAURANTS AND STORES, AND IS PARTIALLY SHADED. WE NOTICED JUST SLIGHTLY EASIER RIDE SOUTH. 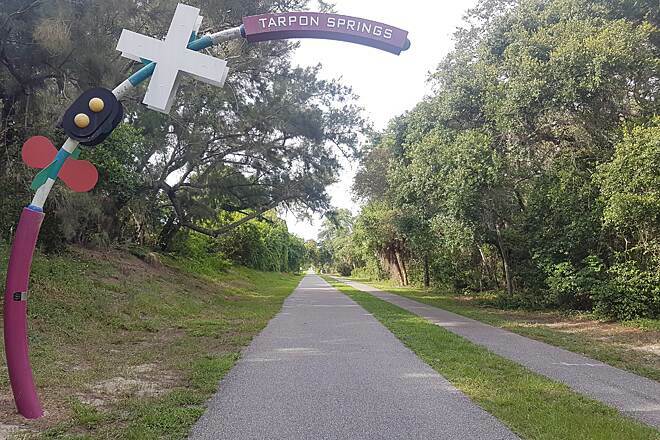 I recently rode the trail from Tarpon Springs to St Pete and back to Tarpon Springs in late Feb while visiting the area from PA. Aside from the numerous street intersections the the trail is a great urban ride. Totally enjoyed riding the overpasses with the scenic views along the highway. 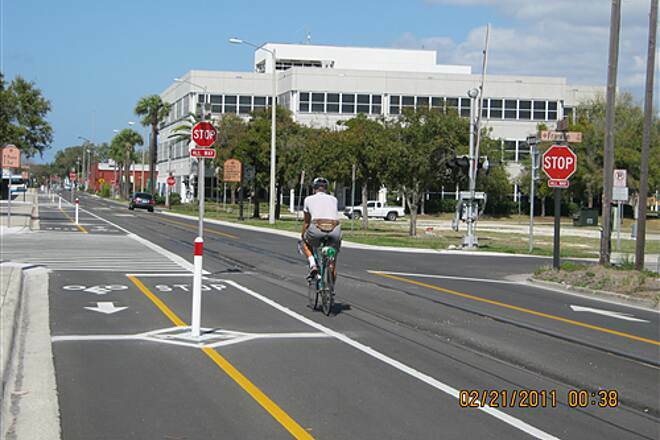 The bikelane in Clearwater appeared quite new and the motorists very ''accomodating'' for mid-morning traffic. Ride out to Honeymoon Island is a very nice diversion. Numerous parks along the trail to stop for a break and many commercial places to purchase food/drink/etc. Great BBQ along trail in Dunedin was worth the rest stop. I found the trail to be in very good condition and want to compliment the county folks for their continued upkeep. A truly great ride....Weather was terrific too! I had been wanting to put this trail on my quest to ride 100 rail trails in the US and it was a excellent for an urban trail. (It was number 74). We had a little trouble finding the southern end. From what I can tell from the map, it actually begins by the waterfront on Tampa Bay. I began riding it around the area described and found out later it was about 2 miles from the start. The day I rode (March 2) the weather and temperature excellent. The trail was well marked and there were a number of nice parks and facilities along the way. My wife and I had planned to meet in Clearwater for lunch, but she had a bit of difficulity find the trailhead. 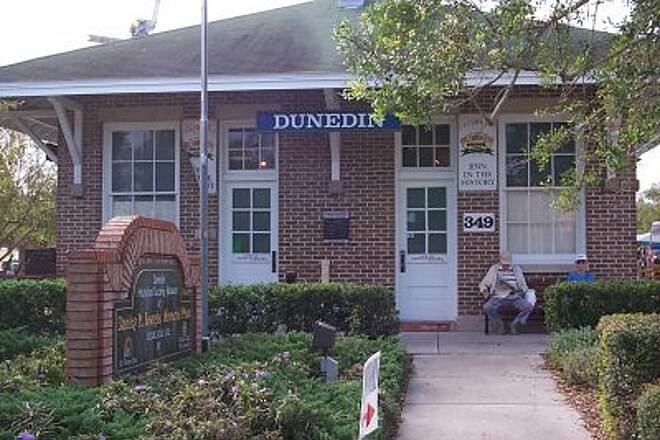 I stopped in Dunedin and used a phone at the Dunedin Police Museum and reconnected with my wife for lunch in Palm Harbor. I also wasn't clear where the northern trail ended. The sidewalks were marked for the trail beyond where the instructions said it ended. Would love to ride the trail again in the future. Nice urban trail, but lots of stops & slowdowns. I rode the northern half of this trail in Feb. The weather was remarkably beautiful except for a strong south breeze which pushed me quickly back once I reversed directions. It's a nice urban/suburban trail but don't expect to do it very fast as there are so many stops & slowdowns at intersections. 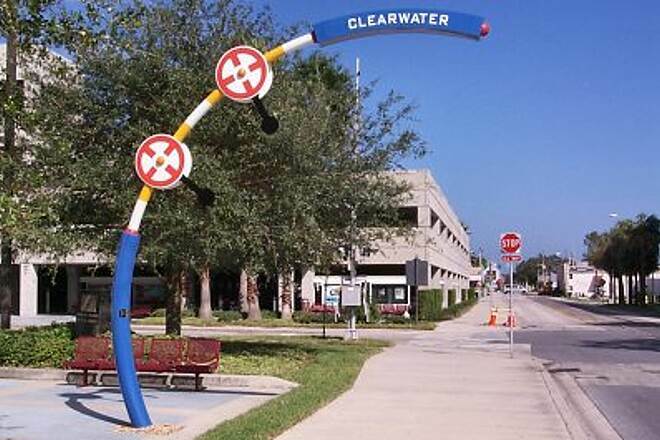 Clearwater is the least fun part of it as has numerous turns, goes on sidewalks, has unclear painted arrows, plus lots of traffic. There are several bridges which take you over traffic, rather than having to stop for it. 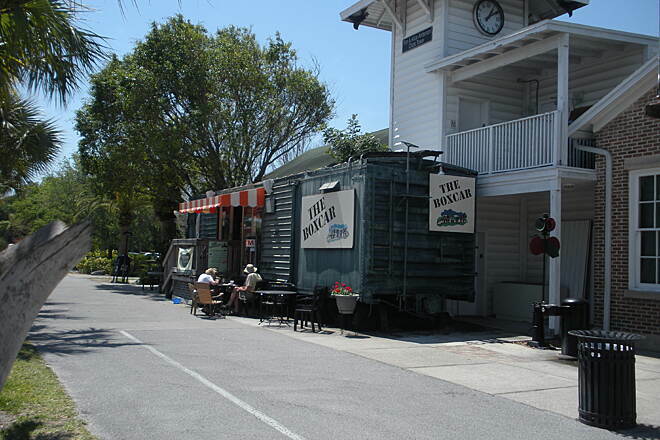 Dunedin is a cute little touristy town, stop at the Box Car for some potent java. 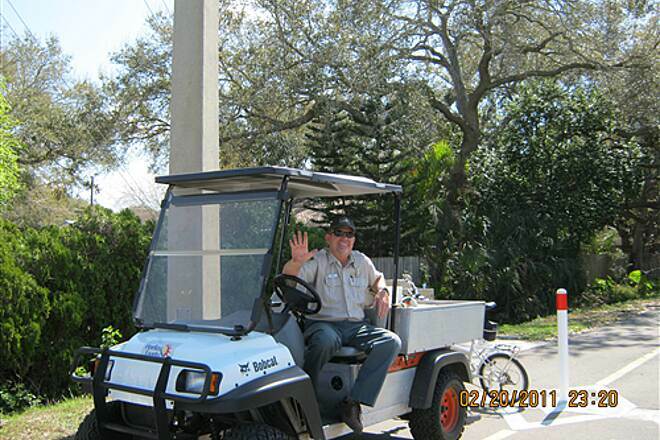 I met a friendly gentleman named Greg who works for Pinellas County maintaining the trail. He'd like to see more volunteers to help with the work as staff has been severely cut. The best surprise on this trail was Taylor Park in Largo near the mid-point. There's a nice shelter with picnic benches and some beautiful scenery near a small lake; worth the stop even if you don't need a rest. 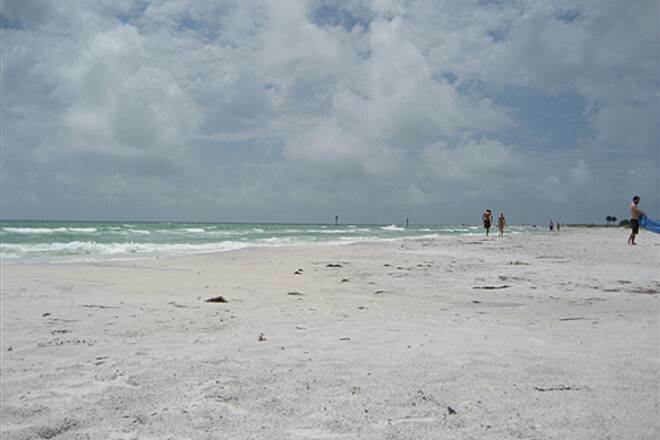 Oh, and don't miss the little side trip to Honeymoon Island--well worth the extra few miles. I'm looking forward to riding the St. Pete end of the trail on my next Florida excursion. I have rode many different sections of the Pinellas Trail since buying a road bike last June. Having ridden alone on the trail on both week days and weekends and at varying times of the day I have never once had an issue with safety. There are many public parks along its course where you can stop to get water or use the facilities. The landscape ranges from urban to very scenic depending on the section you are riding. There are also many bike shops along the way where you can stop and get supplies if necessary. 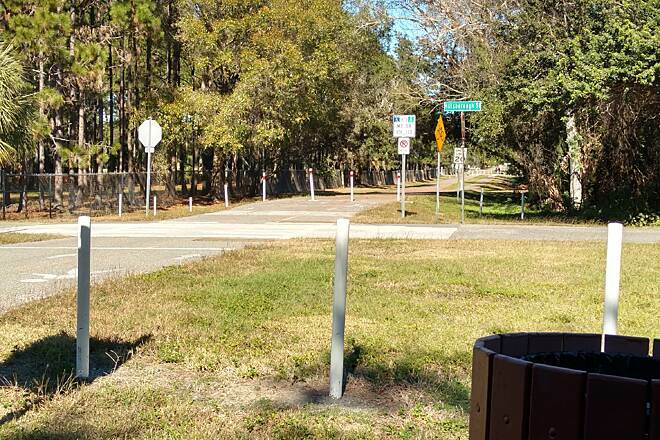 I just recently rode the entire trail from Saint Petersburg to Tarpon Springs out and back. I use the GPS on my phone and as of the writing of this review, from Demens Landing in Saint Ptesburg to the signs that mark the trail end at the intersection of Melon Street and Keystone Road is 38.5 miles, not the 34 miles listed on this web site. This is a 77 mile ride out and back. I validated this on the Map My Ride web site and it came up the same. 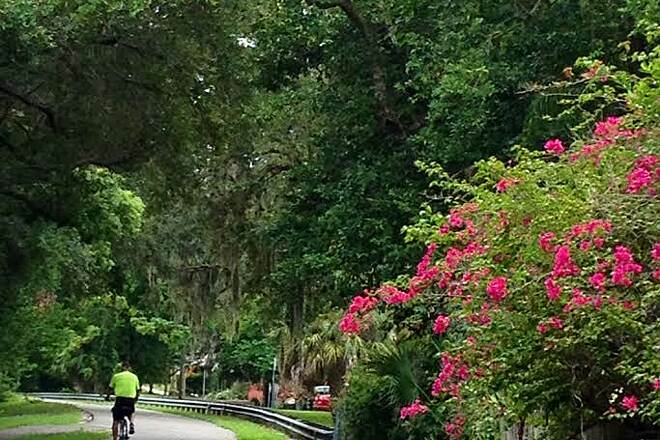 We travel form WI every year in March to bike many of Flordia's great trails. 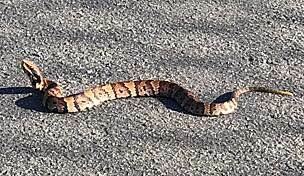 After several years of excellent rides on the Pinellas Trail, we finally experienced the hazards of an urban trail. Four teens entered the trail in fornt of us, and riding side by side started running everyone off the trail. After several miles we attempted to pass, because they were going very slow. At that point they attempted to crash both my wife and I. They tried to knock us off our bikes, and threatened us for over a mile, before we left the trail for safety. This happened just south of Tarpon Springs. We won't be returning to this trail! 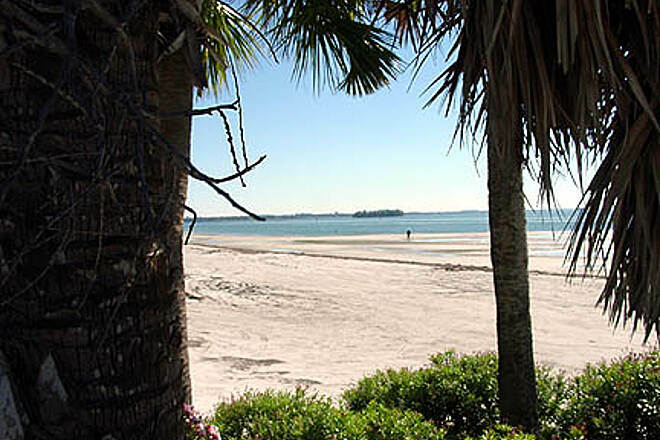 We loved the Pinellas Trail so much we are returning two weeks after our first roundtrip tour from Gulfport to Dunedin. 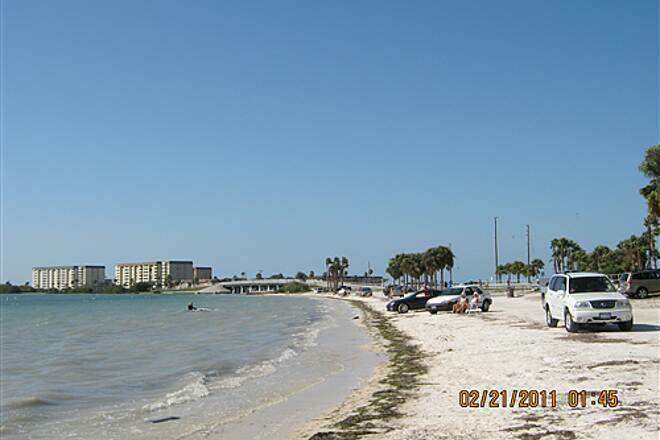 We have set aside three days and look forward to exploring more spurs and more of the area, including Tarpon Springs and returning to Honeymoon Island State Park and its white, sugar-sand beaches. We greatly appreciate the courtesy shown to cyclists by motorists and the foresight in building and maintaining this user friendly corridor. The small printed triptik-like map provided free of charge by Pinellas County Planning Dept was mailed to us and was invaluable. I look forward to the day when Miami-Dade uses old rail beds to create something similar. 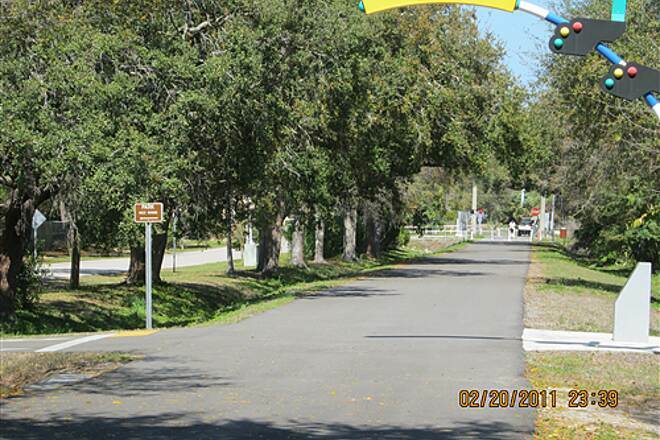 The Pinellas Trail has an office just a short distance from the trail on the north entrance to Walsingham Park. At the office you will be able to pick up a map of the trail showing stops along the way. Such as places to eat and refreshments. Places to get you bike repaired, and comfort stops includung water fountains for humans and dogs! You can also find rangers and volunteers along the trail willing to help. If you decide that you are to tired to ride back! One of the many county busses are equipt with bike reacks on them. 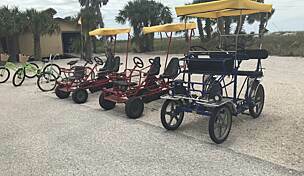 A must ride when visiting Pinellas County FL. The Pinellas Trail is close to where I live, so it's the trail I use the most. It's a wonderful asset to the area. Pros: Food, bike shops and (heaven forbid) hospitals are all near the trail. Cons: The area is very populated and there are many cross roads. However, bridges cross many of the most heavily traveled roads. be careful and obey traffic signs and control devices. I park my car south of Downtown Clearwater, which is about half-way in the trail. In that way, I can use my car as a SAG Station as I double-back down the trail. 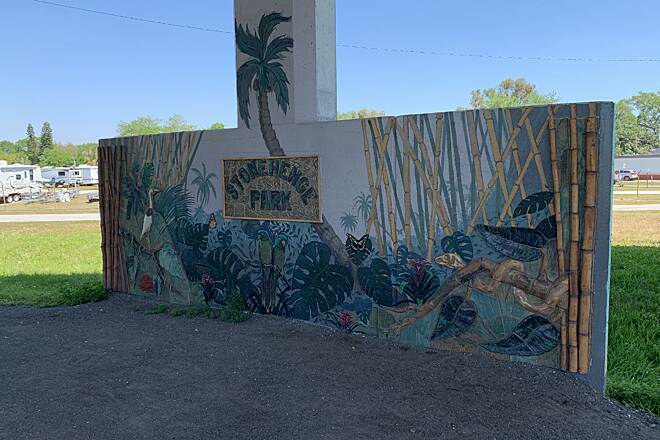 The south end of the trail was extended from US 19 (South 34th Street) to Demens Landing, on the waterfront in downtown St. Petersburg. This added a few extra miles to the trail, which is now, I believe, somewhat longer than the 34 miles listed on this site. There are many areas to stop, rest and have a chat with other weekend athletes. While another writer noted that there was a mugging on the southern most section of the trail, I have not had problems. It's not an area, however, that I care to take a rest in. 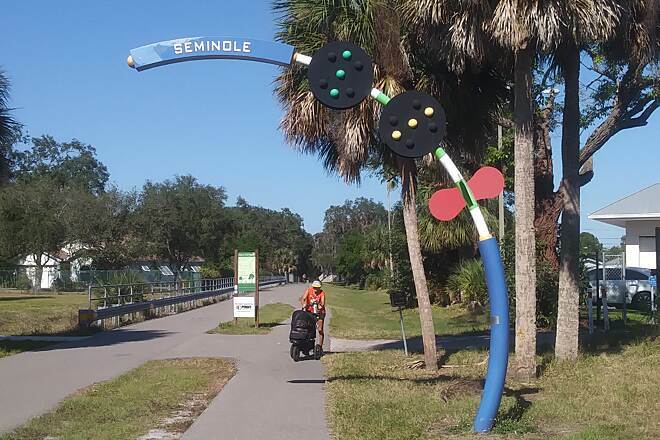 I had the pleasure of riding this trail on Thursday, March 19, 2009 and did make the ride from the starting point in St. Pete to the end in Tarpon Springs, as well as the return. First the pros: There are some very beautiful parts to this ride, and the bridges and crossings do offer very panoramic views. The path is beautifully marked. You are never far from refreshments and I think there were at least a half dozen bike shops right on the path in the case of an emergency. There were very nice parks along the way to stop and stretch. 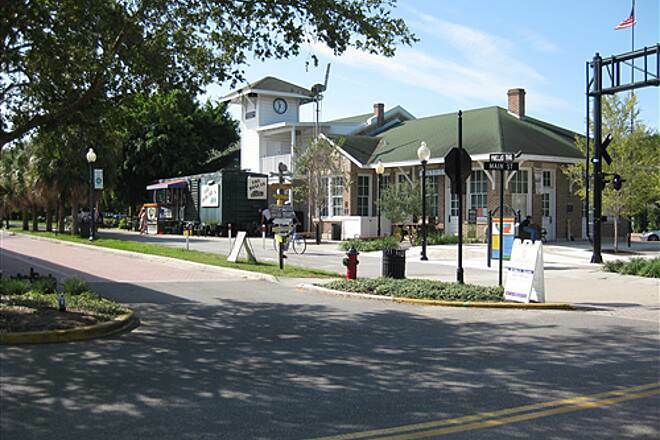 The ride through the towns of Dunedin and Tarpon Springs was excellent. The cons: The beginning of the ride, mabey about 4-5 miles in goes through a tough area. A few days before my ride I understand there was a mugging on the path, and I could clearly see the poetential for trouble as I went through this area, but only for a mile or so. I would use caution at this point in the ride. There are to many breaks in the ride for the avid distance rider, lots of stop and go at intersections. I highly recommend this ride for touring riders as well as the serious rider. Very enjoyable and scenic, and perfect for family rides and for the kids as well. 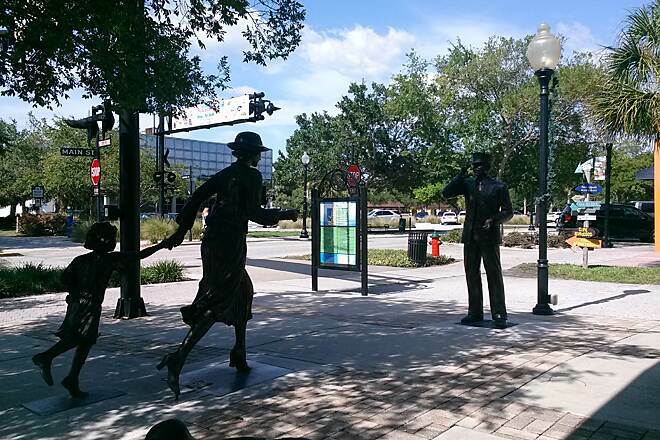 Hints and tips for the Pinellas trail. It looks like it has been a long time since anything got posted here. As I was reading through some of the posts, I noticed a lot of people are not from the area. My wife and I are avid cyclist, and have ridden many trails. 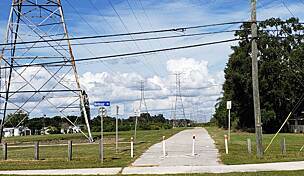 The Pinellas trail is pretty typical of the trails we have been on. Currently they have some sections closed due to resurfacing and fixing bridges. Check there for the latest closings and information on the trail. We normally drive to the section we want to ride, so here are a few good places to get on the trail. Curlew road and Alt 19. There is a shopping center on the north west corner of the intersection. Park there and pick up the trail on the east side of Alt 19. We did that and headed south. 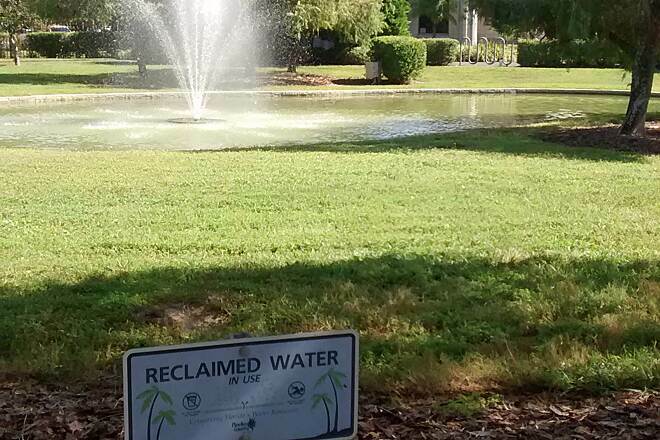 Another good place to dump in is at Taylor Park in Largo. That is a beautiful park with full facilities and plenty of parking. At the Southern most end of the trail, there is a little park. It's a little hard to find, and the neighborhood is a little rough, but for the most part, you should be okay as long as you do it early like I did on a Saturday morning. If you dump in there and head north, about 2 miles you will see a cemetary on the right. It has some pretty big pine trees there. Stop and look in the tops of the trees. There are a couple of Eagles nests in the tops. I went the day after black Friday, and got to see the babies being fed. My favorite sections were Crystal Beach, North Dunedin, Dunedin, Largo, North Seminole, and the Bay Pines Area. Least liked was the section through downtown Clearwater at that point it really isn't a trail. You ride the sidewalks and the curbs crossing the streets are really rough for our road bikes. The only good thing about the downtown section was Pickles Plus. You have to get off the trail and head toward the water. 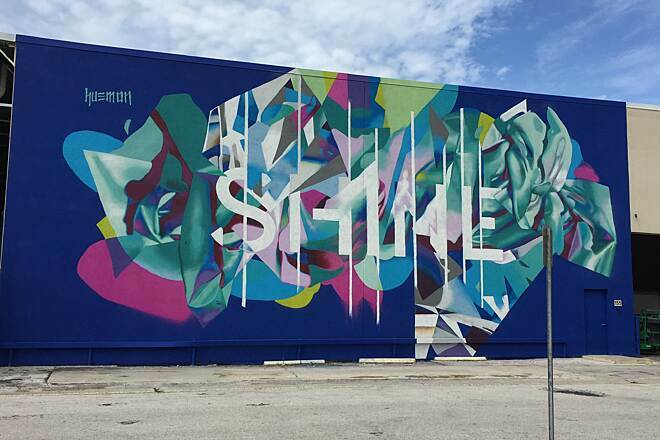 There is a large Steinmart at the corner of Pierce St and S Osceola Ave which is about a block or two west of the trail. 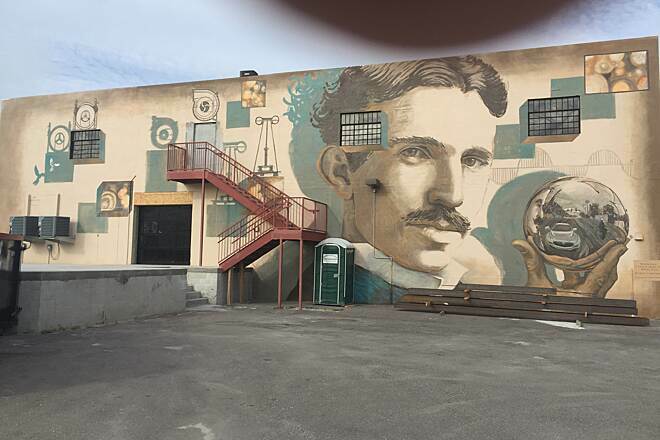 It is right next to Coachman Park. Right behind Steinmart is the Pickles Plus Deli. They make the best sandwiches I have had in a while. All in all this is a nice trail to ride. We broke it up in to 8 to 10 mile sections due to other obligations, and did the whole trail in 2 weekends. "We're camping 1 block from the trail. So nice that there are so many sidewalks and bike lanes connecting the trail to many businesses, (grocery stores, etc) At least on the North end of the trail we feel safe. Don't know about the south end." 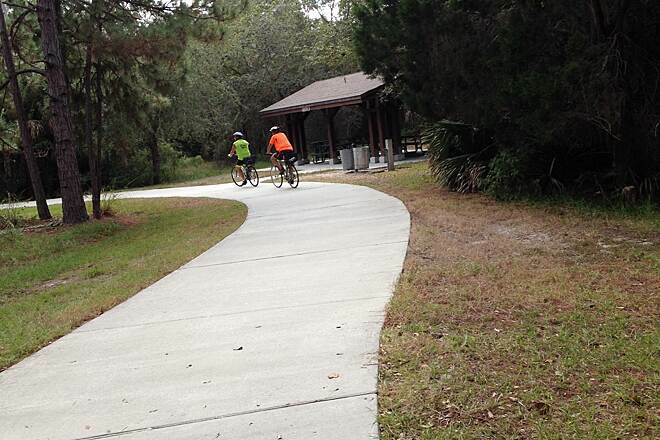 "I live in Gulfport FL November thru April (Snow Bird)and ride this trail frequently. After all it goes right behind my house. 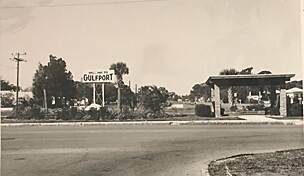 The Gulfport Spur is worth the ride. The spur takes you down town to the business district with many shops and eateries. On Sundays there are the Girls ""Beach Ball"" games that go one during the afternoon hours as well as music and dancing under the Palm trees on the shore line of Boca Ciaga Bay. 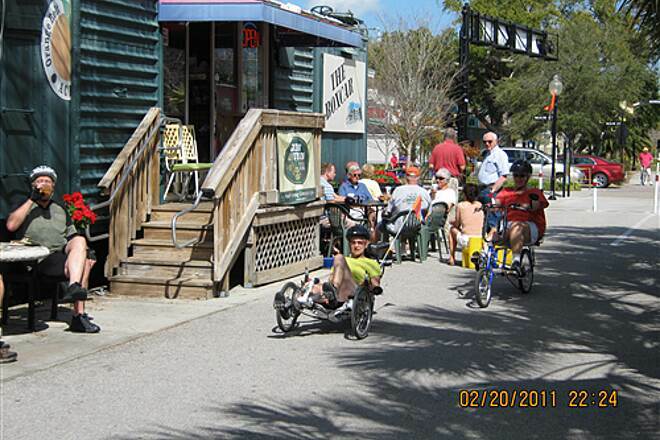 So when on this trail make sure you visit one of Florida's secret hidaways , Gulfport. " "Good trail, but a few ruff areas." 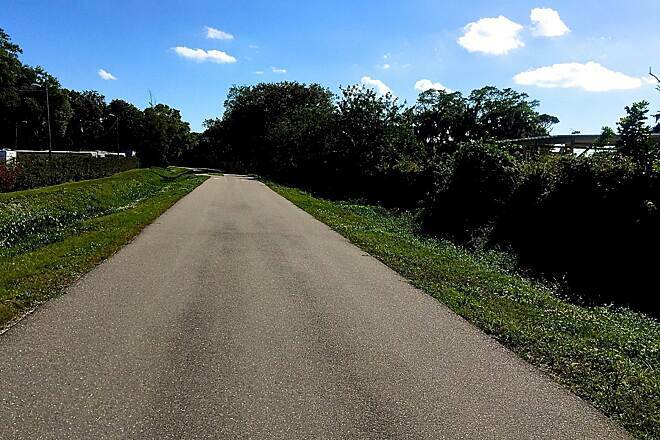 "I love the pinellas trail, not only is it scenic in spots it is long. The only part that gets me down is that it also passes through some neighborhoods that are not so scenic which if you enter the trail between these areas it might be a short ride in both directions. I know that there are some things in those areas that I don't want my kids to see or ask me questions about. I like to pick my time when I think that they are ready. " I rode on this ride in January 2006. It's great! I'm going back later this year! Thanks Rails-to-Trails and Pineallas County! "Nice visit to Farmer's Market, too"
We enjoyed the trail and the four way stops at most roads so we didn't have to wait for traffic at every road. Rode to Clearwater from Tarpon Springs and enjoyed the Farmer's Market. Just happened to be the right day. 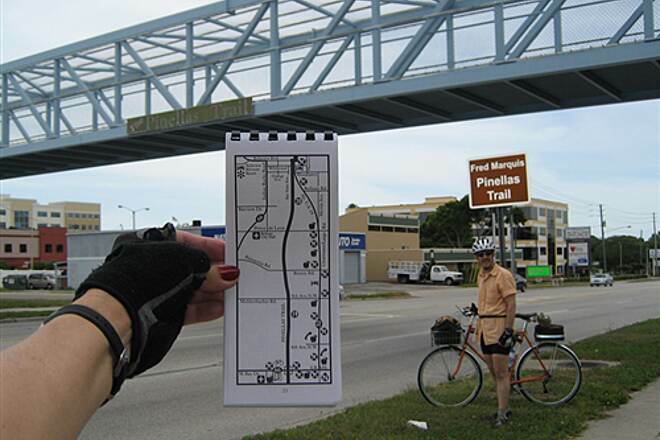 Pinellas Trail-one of the best!!! "Rode several sections of the trail this past January, it was excellent, loved the elevated sections! " 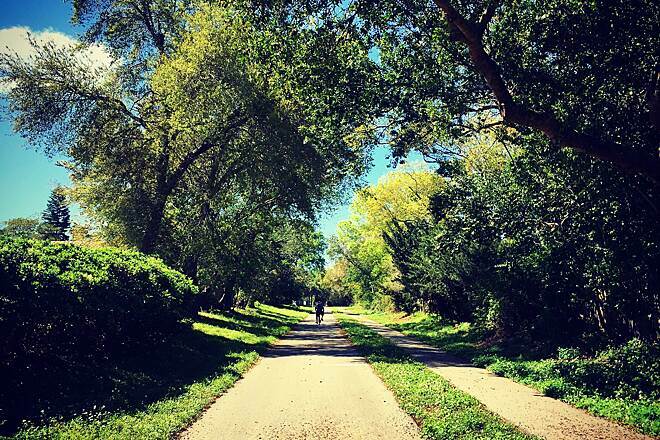 "We stumbled upon this trail while on vacation and WOW what an asset to your community. We walked parts of it twice a day Semiole South. Can't wait to get back down there to walk other sections of it, we're in awe of it all. Highly recommended." 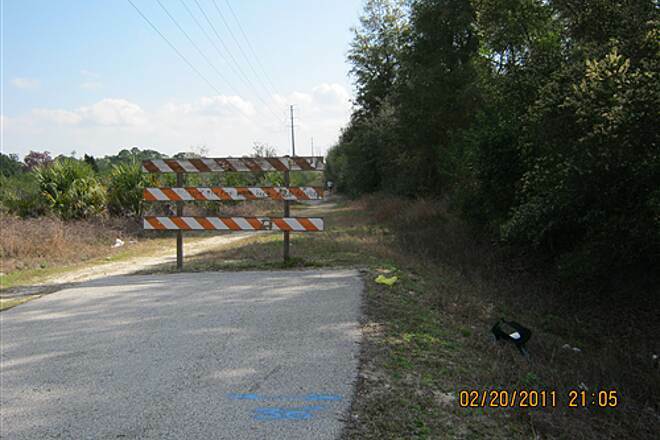 "We enjoyed a short trip from Largo to North Clearwater where the trail disappeared into a construction site (March 2005). Good, wide and sunny." 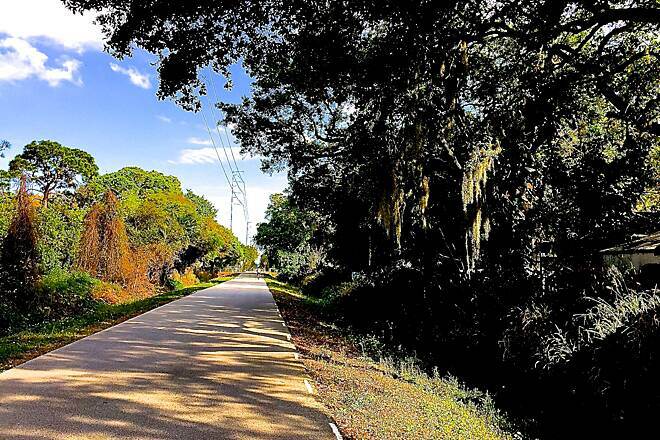 "We travel around the country doing these rail-trails, & found the Pinellas to be Ok. It is VERY wide (though we couldn't figure out why, as it was devoid of people on an 80 degree Saturday in March). The scenery is ok as well. The most interesting part of the trail is the southern end where you cycle along protracted stretches of elevated track-way above the city. The best feature of the trail however is Eli's BBQ, at about the midpoint. Right off the trail, underneath some beautiful trees, Eli cooks up some mean pork BBQ. Best meal of our entire trip! Some warnings: No (I mean NO) bike shop will do bike repairs beyond flats on a Saturday. We had to ride 3 miles into town to get a brake cable replaced. The shop in Tarpon Springs was actually rude to us when we asked for help! Also, we witnessed a drug buy, right off the trail, near the southern end...."
"My 13-year-old son and I rode from Clearwater to Tarpon Springs on a 75 degree Sunday in February. 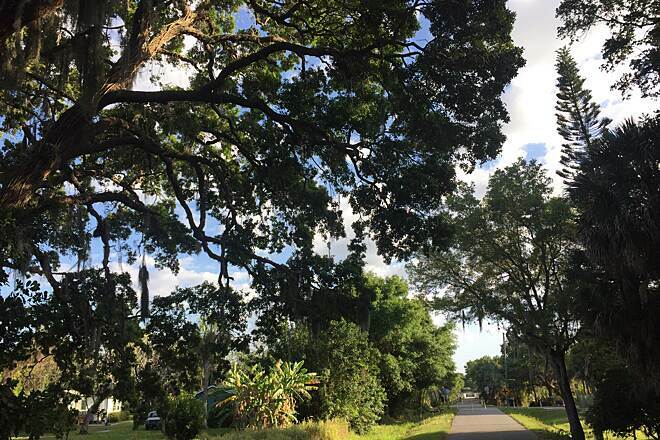 The best part of the Pinellas Trail is between northern Clearwater and central Dunedin. We had noticed that the Gulf was visible, so we detoured a few blocks and found a great sidewalk right along the bay for a couple of miles. In central Dunedin, the development cuts off access to the bay, so we headed back to the trail. At the old depot in Dunedin, a fair was going on with food vendors. 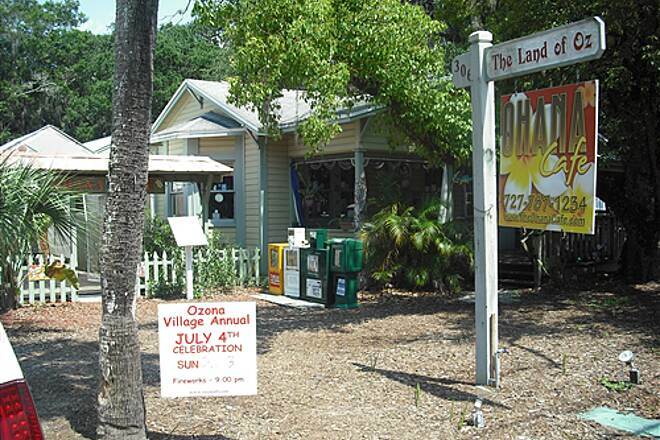 There are several places to eat right along the trail, and they were open on Sunday morning- in Tarpon all but one of the restaurants were closed even at lunch time. In north Dunedin we were able to briefly access the bay before heading back to the trail. If you ride on a sunny day in winter, ride south to north so the sun won't be in your eyes. There is virtually no shade on this trail, although the palm trees are pretty. I can't imagine doing this trail in summer. In north Dunedin the trail is next to a major road with some fast food places if you get thirsty. The locals seem to support this trail. In Dunedin, all the crossings are four-way stops. While in Palm Harbor this is not the case. At nearly every crossing the cars waved us through. There were many other trail users, although it was not jammed. Tarpon seemed dead-lots of antique shops but almost every restaurant was closed. Clearwater is a little run down and I wouldn't go through parts of it at night, but there are plenty of places to get provisions. On the trail, in addition to palm tees everywhere, there are many beautiful live oaks draped with Spanish moss. Normally this would provide shade, but the trail has been made so wide to accomodate the traffic that there is no shade on the part we rode. In most areas, there is a separate area to walk or jog." 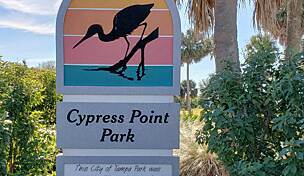 "I rode the length of the trail from St. Petersburg to Tarpon Springs last month. 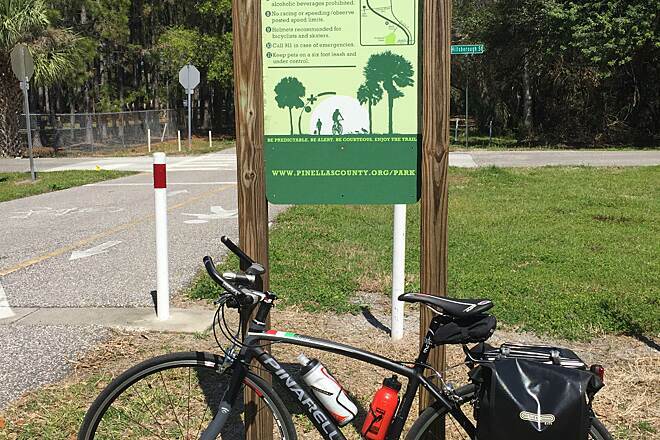 Before you go, make sure to visit the Trail Web site at www.pinellascounty.org/trailgd. This site tells you where the stops are, where to park, where to eat, where the bike shops are, and what to look out for. I strongly recommend you read this first! And then plan your ride according to your own personal desires! It's a wonderful trip, especially if you take your time and stop along the way to see sites and parks. I felt safe the entire way." Great trail but keep your eyes open! 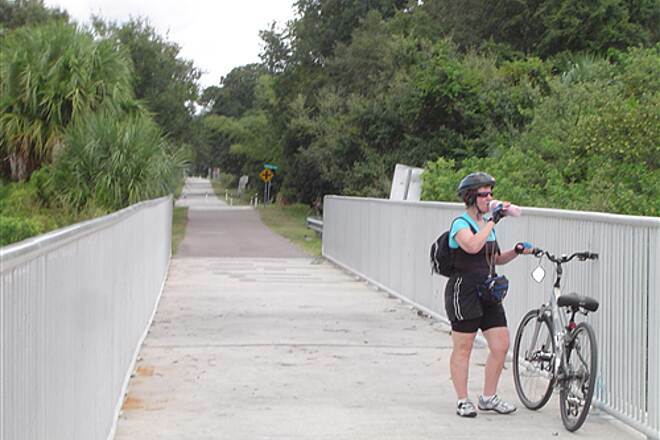 "The Pinellas Trail is a wonderful example of a county going all out for recreation. 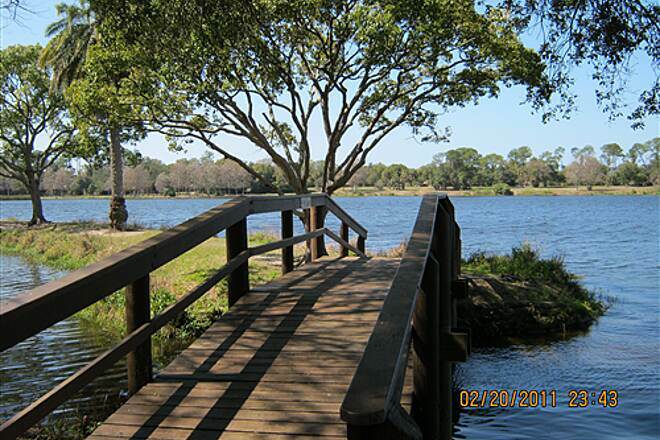 The paths are wide and well marked meandering through great areas such as Dunedin and Tarpon Springs. My husband and I love the ride. There are canopied areas and a few bridges over busy intersections to test your climbing skills. Unfortunately we did notice that no one shares the rules of the trail when riding. 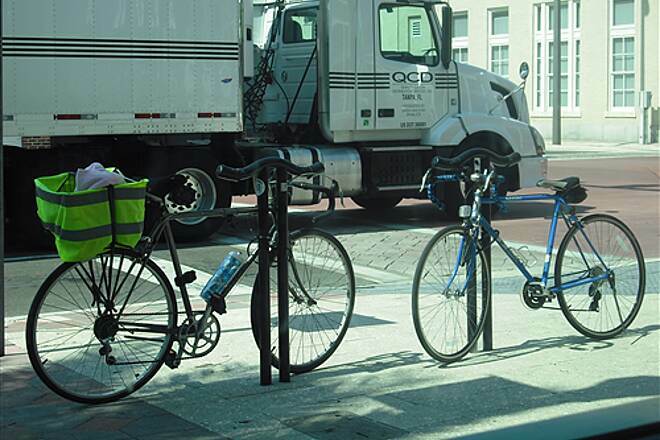 Bicycle riders ride two abreast when approaching other riders and don't ""Share the Trail."" Children on motorized scooters snake their way up the path and joggers choose to use the biking path to run rather than the running/walking path. Worst was a dog walker who stretched her dog's lease across the trail and almost caused an accident. She was oblivious to the fact that there were riders on the path. So enjoy the trail, but please follow rules of bicycling and be safe and alert. " 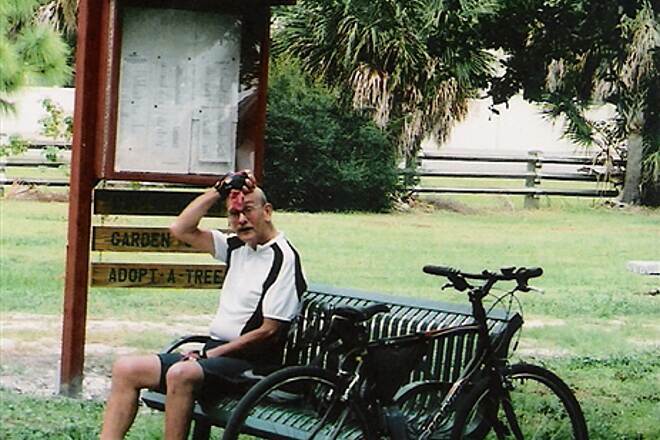 "We rode the Pinellas Trail on Thanksgiving 2003 and the Friday after Thanksgiving. We rode from mile 34 to Dunedin and looked around the town and then returned. We rode on Friday from Dunedin to mile 0 and then on our return to Dunedin we went to the causeway and out to the gulf. All together Friday was over 50 miles, but it was very easy riding even for my wife. There was excellent scenery both days. My only complaint is that there are no trailheads with parking along much of the trail and as visitors to the area, we didn't know where we could legally park. " 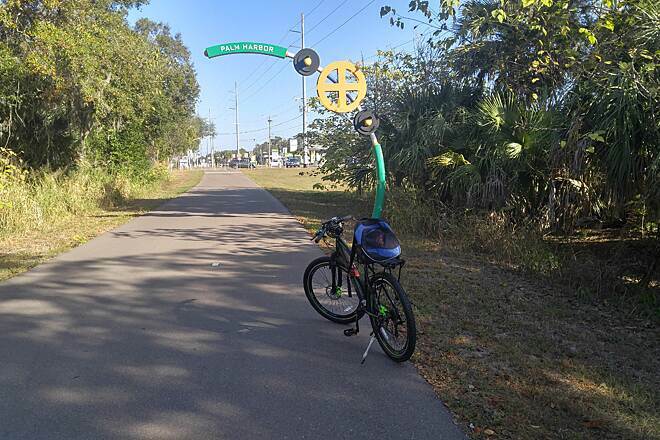 The Pinellas Trail is a wonderfully functional trail. 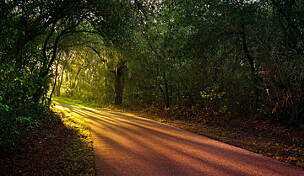 My favorite section is between 102nd Ave in Seminole and the Cross Bayou bridge - beautiful! There are 2 restrooms and water fountains along that 6-mile stretch (Seminole City and Blossom Lake parks) and no busy intersections. "Greetings from Vancouver BC, Canada. 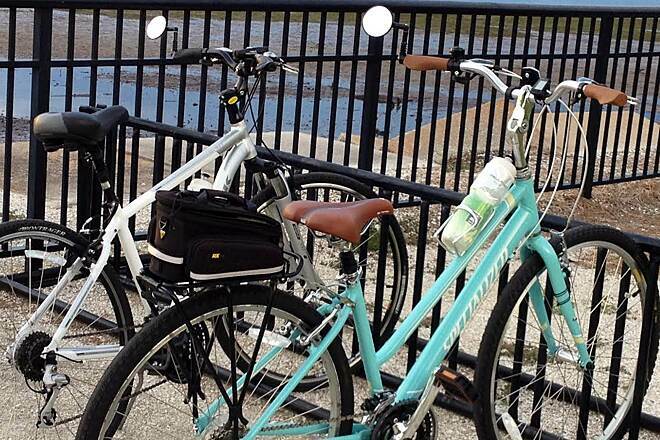 We just returned from a vacation in Florida in which, amongst other things, we cycled the Pinellas trail. My wife and I are no neophytes to touring by bike, having cycled ""der Romantische Strasse"", Passau-Vienna-Budapest, and the round the San Juan Islands trip in Washington State etc etc. 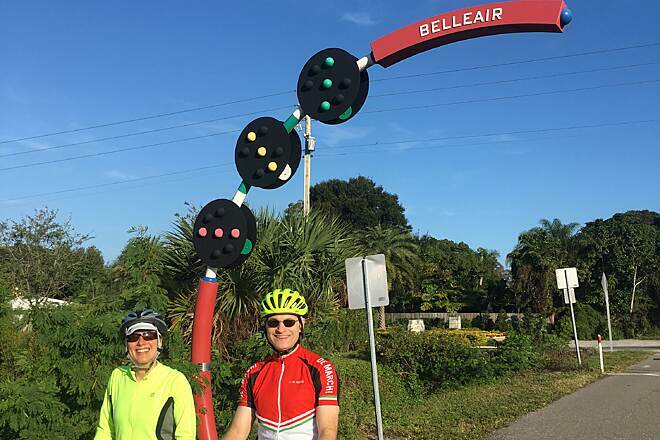 We wish to convey our sincere appreciation to those who had the foresight and industry in creating the Pinellas trail, which we cycled last week, on borroewed bikes, spending a night in Tarpon Springs and St Pete Beach. We found the trail to be uniformly excellent, easy riding in a very interesting area. 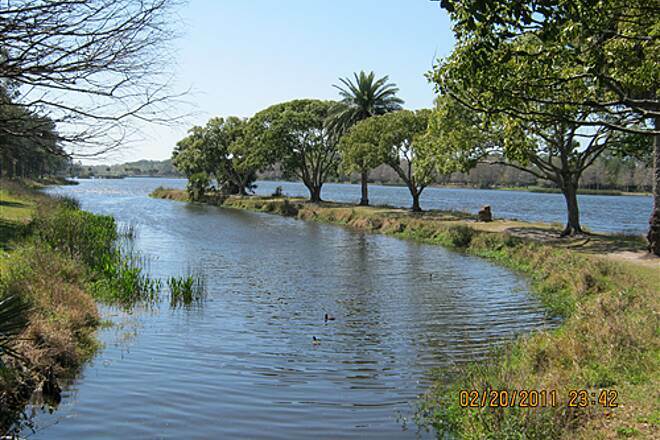 For instance we came across Freedom Park in Clearwater and marvelled that such a place existed. We look forward to the extension of the trail in the future. 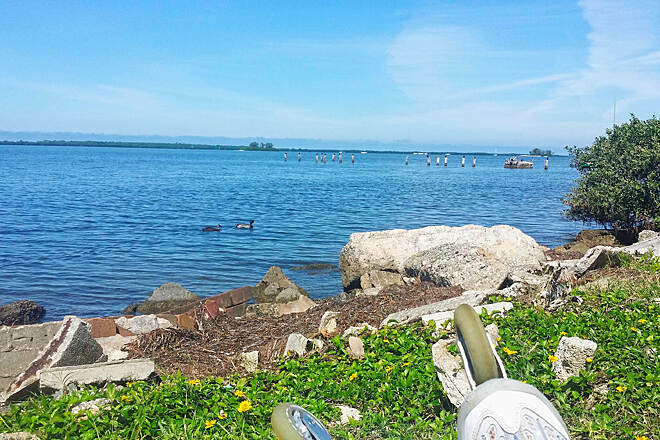 "On 23 December 1999, I skated the length of the Pinellas trail and back on inline skates. The trail is exceptional in terms of scenery, skateability and overall fun. At that time, and likely as I write this, the trail is 35 miles long, but is continuous for that whole distance. A few hints: on the Thursday morning/afternoon that I skated it, the security units on the trail were nowhere to be seen for the entire 70 miles... and there is sometimes a great distance (3-5 Mi) between any civilization on the trail. Also, there were some places where my cellular phone could not pick up a signal - you and/or your party are (seemingly, entirely) responsible for your safety on the trail. 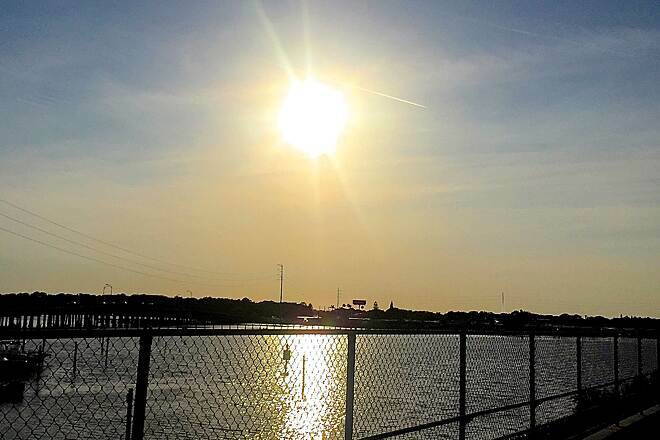 If you are going any distance or are physically exerting yourself, make sure to bring lots of water, the climate in the Tampa Bay region is usually hot/humid. On the whole trail, I recall seeing about 4 water fountains. For an exhilarating ride, there are ~ 7 overpasses on the trail. Sure, the 'skate' up the overpass is difficult, but the ride down can be amazing! On one of these overpasses, I began to roll so fast that my right skate destabilized and began to whip slightly side-to-side! Very, very nice if you like speed. The surface on the trail is far beyond average quality and provides a pleasureable skate on inlines, and by extension should be terrific for other modes of transportation. Good luck and enjoy! Michael"